All reports of volcanic activity published by the Smithsonian since 1968 are available through a monthly table of contents or by searching for a specific volcano. Until 1975, reports were issued for individual volcanoes as information became available; these have been organized by month for convenience. Later publications were done in a monthly newsletter format. Links go to the profile page for each volcano with the Bulletin tab open. Information is preliminary at time of publication and subject to change. Sakurajima is one of the most active volcanoes in Japan and is situated in the Aira caldera in southern Kyushu. It regularly produces ash plumes and scatters blocks onto the flanks during explosions. This report covers July through December 2018 and describes activity at the Minamidake crater, which has continued with the activity typically observed at Sakurajima volcano. In late 2017 the eruptive activity has migrated from being centered at the Showa crater, to being focused at the Minamidake crater. This change has continued into the later half of 2018. The following activity summarizes information issued by the Japan Meteorological Agency (JMA), the Japan Volcanic Ash Advisory Center (VAAC), and satellite data. Activity from July through December 2018 was focused at the summit Minamidake crater with 8 to 64 ash emission events per month, with 50-60% being explosive in nature during four of the six months reported (table 20, figure 67). The maximum explosions per day was 64 on 31 August (figure 68). No pyroclastic flows were recorded during this time. Recent activity at the Showa crater has been declining and no activity was observed during the reporting period. Sakurajima has remained on Alert Level 3 on a 5-level scale during this time, reflecting the regular ash plumes and volcanic blocks that erupt out onto the slopes of the volcano during explosive events. Table 20. Monthly summary of eruptive events recorded at Sakurajima's Minamidake crater in Aira caldera, July-December 2018. The number of events that were explosive in nature are in parentheses. No events were recorded at the Showa crater during this time. Data courtesy of JMA (July to December 2018 monthly reports). Figure 67. 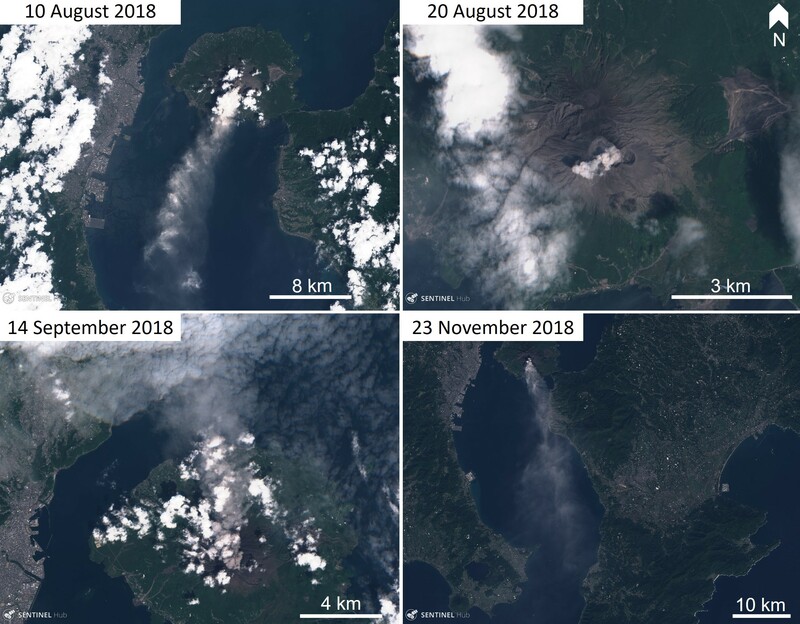 Satellite images showing ash plumes from Sakurajima's Minamidake summit crater (Aira caldera) in August, September, and November 2018. Natural color satellite images (bands 4, 3, 2) courtesy of Sentinel Hub Playground. Figure 68. Explosions per day at Sakurajima's Minamidake summit crater (Aira caldera) for July through December 2018. Data courtesy of JMA. Activity through July consisted of 29 ash emission events (16 of which were explosive) producing ash plumes up to a maximum height of 4.6 km above the crater and ballistic ejecta (blocks) out to 1.7 km from the crater, but ash plumes were more commonly 1.2 to 2.5 km high. The largest explosive event occurred on 16 July, producing an ash plume up to 4.6 km from the vent and ejecting ballistic rocks out to 1.3-1.7 km from the crater (figure 69). On 17 July, sulfur dioxide emissions were measured at 1,300 tons per day, and on 26 July emissions were measured to be 2,100 tons per day. Figure 69. Ash plumes erupting from the Sakurajima Minamidake crater (Aira caldera) on 16 July 2018 at 1538 (upper) and 1500 (lower) local time. The ash plumes reached 4.6 km above the crater rim and ejected rocks out to 1.3-1.7 km from the crater. Higashikorimoto webcam images courtesy of JMA (July 2018 monthly report). During August the Minamidake crater produced 64 ash emission events (37 explosive in nature) with a maximum ash plume height of 2.8 km above the crater, and a maximum ballistic ejecta distance of 1.3 km from the crater on 31 August (figure 70). Ash plumes were more commonly up to 1 to 2.1 km above the crater. Sulfur dioxide emissions were very high on 2 August, measured as high as 3,200 tons per day, and was measured at 1,500 tons per day on 27 August. Figure 70. 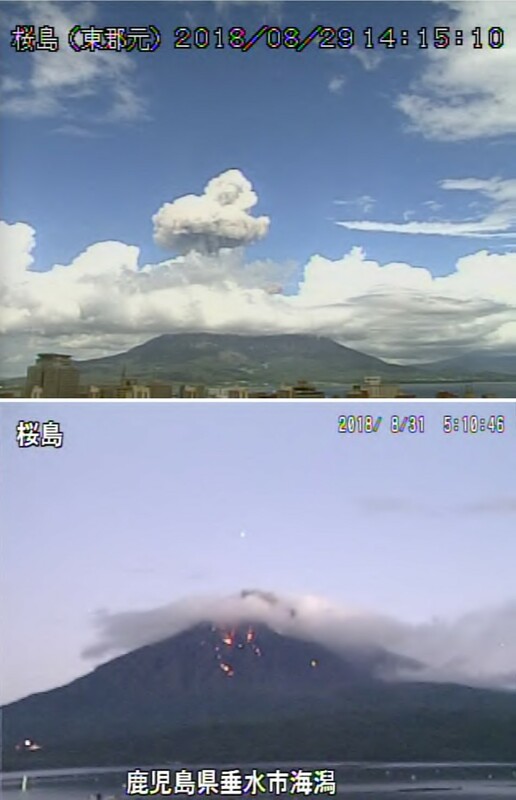 Activity at Sakurajima volcano (Aira Caldera) in August 2018. Top: A gas-and-ash plume that reached 2.8 km above the crater at 1409 on 29 August. Bottom: Scattered incandescent blocks out to 1-1.3 km from the crater on the flanks of Sakurajima after an explosion on 31 August. Higashikorimoto and Kaigata webcam images courtesy of JMA (August 2018 monthly report). Throughout September 44 ash emission events occurred, with 22 of those being explosive in nature. The Maximum ash plume height reached 2.3 km above the crater, and the maximum ejecta landed out to 1.1 km from the crater. An explosive event on 9 September ejected material out to 700 m away from the crater and on 22 September an event scattered blocks out to 1.1 km from the crater (figure 71). Figure 71. Incandescent blocks on the flanks of Sakurajima volcano (Aira caldera) after an explosion on 22 September 2018 at 2025. The event scattered blocks out to 1.1 km from the Minamidake crater. Kaigata webcam image courtesy of JMA (September 2018 monthly report). October and November were relatively quiet with regards to the number of ash emission events with only 22 events over the two months. The maximum ash plume heights reached 1.6 and 4 km, respectively. 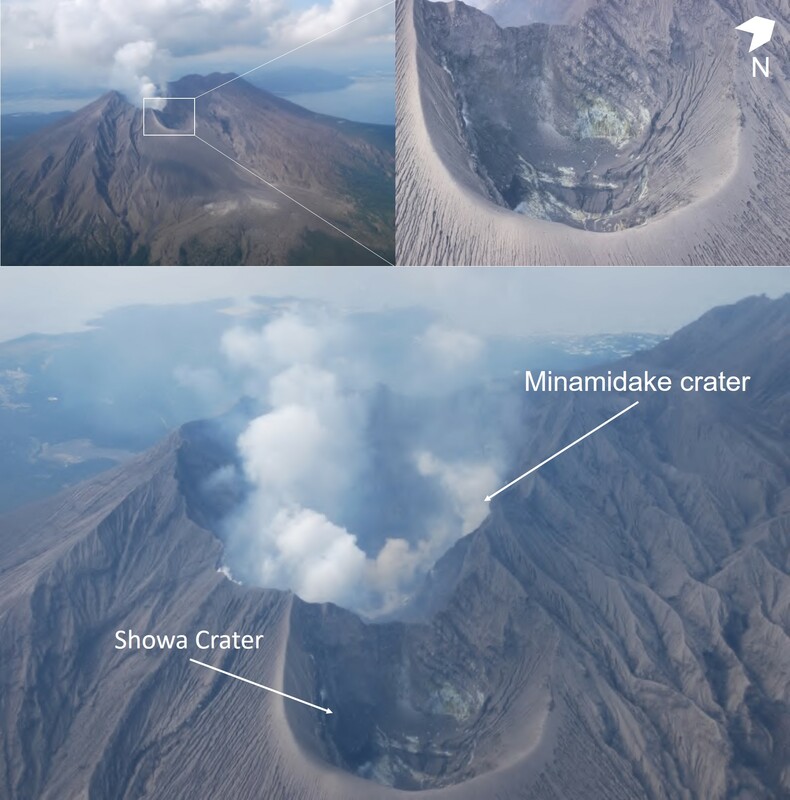 An observation flight on 22 October showed the currently inactive Showa crater restricted to minor fumarolic degassing, and steam-and-gas and dilute ash plume activity in the Minamidake crater (figure 72). An eruption on 14 November at 0043 local time produced an ash plume to over 4 km above the crater and scattered incandescent blocks out to over 1 km from the crater (figure 73). This was the first ash plume to exceed a height of 4 km since 16 July 2018. Two events occurred during 16-19 November that produced ash plumes up to 1.6 km. Sulfur dioxide measurements were 3,400 tons on 4 October, 400 tons on 17 October, 1,000 tons on 23 October, 1,100 tons on 6 November, and 1,400 tons on 20 November. Figure 72. Minor fumarolic degassing has occurred in Sakurajima's Showa crater (Aira caldera) and the vent has been blocked by ash and rock. The active Minamidake crater is producing a blue-white plume to 400 m above the crater and a dilute brown plume that remained within the crater. Images taken by the Japan Maritime Self-Defense Force 1st Air Group P-3C on 22 October 2018, courtesy of JMA (October 2018 monthly report). Figure 73. Eruption of Sakurajima (Aira caldera) on 14 November at 0043 local time ejecting incandescent blocks more than 1 km from the crater and an ash plume up to 4 km above the crater. Photos courtesy of The Asahi Shimbun. Small ash plumes continued through December with 56 ash emission events, 34 of which were explosive in nature. The maximum ash plume height above the crater reached 3 km, and the maximum distance that ejecta traveled from the vent was 1.3 km, both during an event on 24 December (figure 74). An explosive event produced an ash plume that reached a height of 2.5 km above the crater and scattered ejecta out to 1.1 km from the crater. Figure 74. 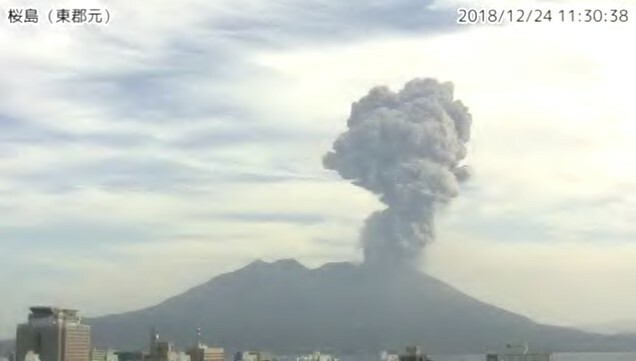 An explosive event at 1127 on 24 December 2018 at Sakurajima's Minamidake crater (Aira caldera). The ash plume reached 3 km above the crater rim. Higashikorimoto webcam image courtesy of JMA (December 2018 monthly report). Intermittent incandescence was observed at the summit at nighttime throughout the entire reporting period. Areas of elevated thermal energy within the Minamidake crater were visible in cloud-free Sentinel-2 satellite images (figure 75) and elevated temperatures were detected in MIROVA on a few days. Figure 75. Sentinel-2 thermal satellite images showing the summit area of Sakurajima volcano, Aira caldera, in October 2018. The areas of elevated thermal activity (bright orange-red) are visible within the Minamidake crater. No thermal anomalies are visible within the Showa crater. Thermal (Urban) satellite images (bands 12, 11, 4) courtesy of Sentinel Hub Playground. Information Contacts: Japan Meteorological Agency (JMA), Otemachi, 1-3-4, Chiyoda-ku Tokyo 100-8122, Japan (URL: http://www.jma.go.jp/jma/indexe.html); Tokyo Volcanic Ash Advisory Center (VAAC), 1-3-4 Otemachi, Chiyoda-ku, Tokyo, Japan (URL: http://ds.data.jma.go.jp/svd/vaac/data/); Sentinel Hub Playground (URL: https://www.sentinel-hub.com/explore/sentinel-playground); MIROVA (Middle InfraRed Observation of Volcanic Activity), a collaborative project between the Universities of Turin and Florence (Italy) supported by the Centre for Volcanic Risk of the Italian Civil Protection Department (URL: http://www.mirovaweb.it/); The Asahi Shimbun (URL: http://www.asahi.com/ajw/articles/AJ201811140035.html accessed on 12 March 2018). Continuing activity at Ibu has consisted of numerous thermal anomalies and, except apparently for the period from September 2017 through early March 2018, intermittent ash explosions (BGVN 43:05). This activity continued through November 2018. The Alert Level has remained at 2 (on a scale of 1-4), and the public was warned to stay at least 2 km away from the active crater, and 3.5 km away on the N side. Ash plumes were seen frequently during May-November 2018 (table 4). Plume heights above the crater were generally 400-80 m. However, ash plumes on 28 and 29 July rose 5.5 and 4.8 km, respectively. Seismicity associated with ash plumes were characterized by explosion and avalanche signals. Table 4. Ash explosions reported at Ibu, May-November 2018. Data courtesy of PVMBG and Darwin VAAC. The number of thermal anomalies during this time, based on MODIS satellite instruments analyzed using the MODVOLC algorithm, ranged from 2 days/month (July) to 9 days/month (September); some events were two pixels. Days with anomalies and ash explosions were not well correlated. The MIROVA (Middle InfraRed Observation of Volcanic Activity) volcano hotspot detection system, also based on analysis of MODIS data, detected numerous hotspots every month of the reporting period, almost all of which were within 5 km of the volcano and of low-to-moderate power. 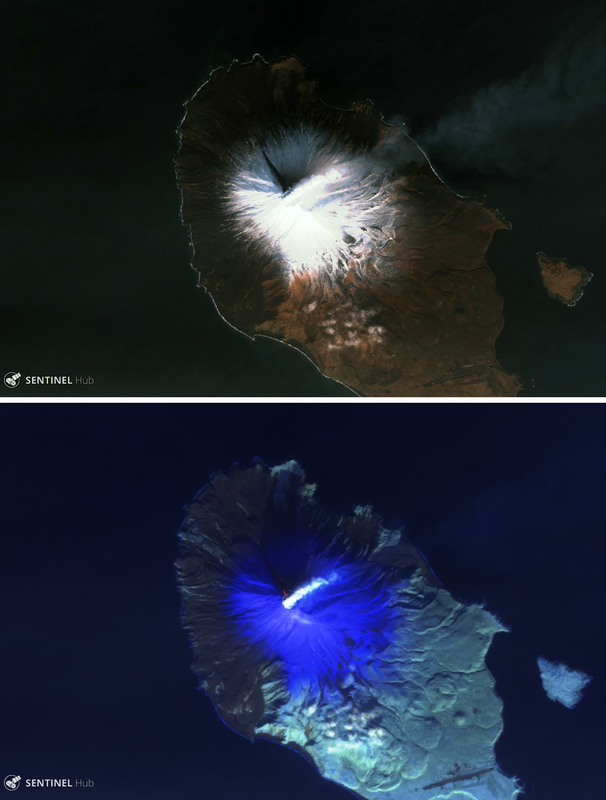 Infrared satellite imagery showed that the volcano had at least two, and sometimes three, active dome or vent locations (figure 14). Figure 14. Sentinel-2 satellite images of Ibu on 19 August 2018. Top image (infrared, bands 12, 11, 8A) shows a large central hotspot and a smaller thermal area immediately to the west. Bottom image (natural color, bands 8, 4, 3) shows both an ash plume (gray) and steam plume (white), along with fresh and older lava in the crater. Courtesy of Sentinel Hub Playground. Geologic Background. The truncated summit of Gunung Ibu stratovolcano along the NW coast of Halmahera Island has large nested summit craters. The inner crater, 1 km wide and 400 m deep, contained several small crater lakes through much of historical time. The outer crater, 1.2 km wide, is breached on the north side, creating a steep-walled valley. A large parasitic cone is located ENE of the summit. A smaller one to the WSW has fed a lava flow down the W flank. A group of maars is located below the N and W flanks. Only a few eruptions have been recorded in historical time, the first a small explosive eruption from the summit crater in 1911. An eruption producing a lava dome that eventually covered much of the floor of the inner summit crater began in December 1998. Information Contacts: Pusat Vulkanologi dan Mitigasi Bencana Geologi (PVMBG, also known as Indonesian Center for Volcanology and Geological Hazard Mitigation, CVGHM), Jalan Diponegoro 57, Bandung 40122, Indonesia (URL: http://www.vsi.esdm.go.id/); Darwin Volcanic Ash Advisory Centre (VAAC), Bureau of Meteorology, Northern Territory Regional Office, PO Box 40050, Casuarina, NT 0811, Australia (URL: http://www.bom.gov.au/info/vaac/); Hawai'i Institute of Geophysics and Planetology (HIGP) - MODVOLC Thermal Alerts System, School of Ocean and Earth Science and Technology (SOEST), Univ. of Hawai'i, 2525 Correa Road, Honolulu, HI 96822, USA (URL: http://modis.higp.hawaii.edu/); MIROVA (Middle InfraRed Observation of Volcanic Activity), a collaborative project between the Universities of Turin and Florence (Italy) supported by the Centre for Volcanic Risk of the Italian Civil Protection Department (URL: http://www.mirovaweb.it/); Sentinel Hub Playground (URL: https://www.sentinel-hub.com/explore/sentinel-playground). Masaya is one of the most active volcanoes in Nicaragua and one of the few volcanoes on Earth to contain an active lava lake. The edifice has a caldera that contains the Masaya (also known as San Fernando), Nindirí, San Pedro, San Juan, and Santiago (currently active) craters. In recent years, activity has largely consisted of lava lake activity along with dilute plumes of gas with little ash. In 2012 an explosive event ejected ash and blocks. This report summarizes activity during May through October 2018 and is based on Instituto Nicaragüense de Estudios Territoriales (INETER) reports and satellite data. Reports issued from May through July 2018 noted that Masaya remained relatively calm. Sentinel-2 thermal satellite images show consistently high temperatures in the Santiago crater with the active lava lake present (figure 65). Figure 65. Sentinel-2 thermal satellite images showing the detected heat signature from the active lava lake at Masaya during May-July 2018. The lava lake is visible (bright yellow-orange) and a gas-and-steam plume is visible traveling towards the W to SW. Thermal (urban) satellite images (bands 12, 11, 4) courtesy of Sentinel Hub Playground. Reports from August through October 2018 indicated relatively low levels of activity. On 28 September the lava lake within the Santiago crater was observed with a lower surface than previous months. Fumarole temperatures up to 340°C were recorded (figure 66). 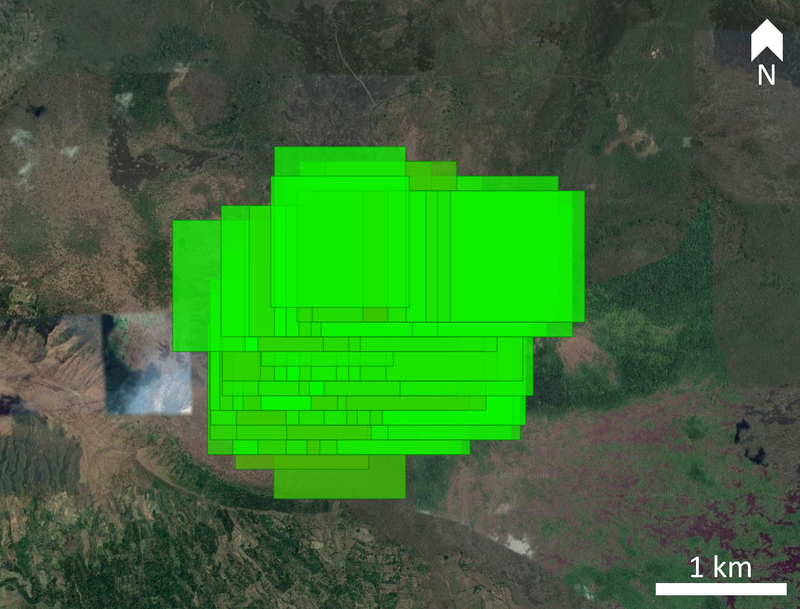 Sentinel-2 thermal images show the large amount of heat consistently emanating from the active lava lake (figure 67). Sulfur dioxide was measured on 28 and 30 August with an average of 1,462 tons per day, a higher value than the average of 858 tons per day detected in February. Sulfur dioxide levels ranged from 967 to 1,708 tons per day on 11 September. Figure 66. 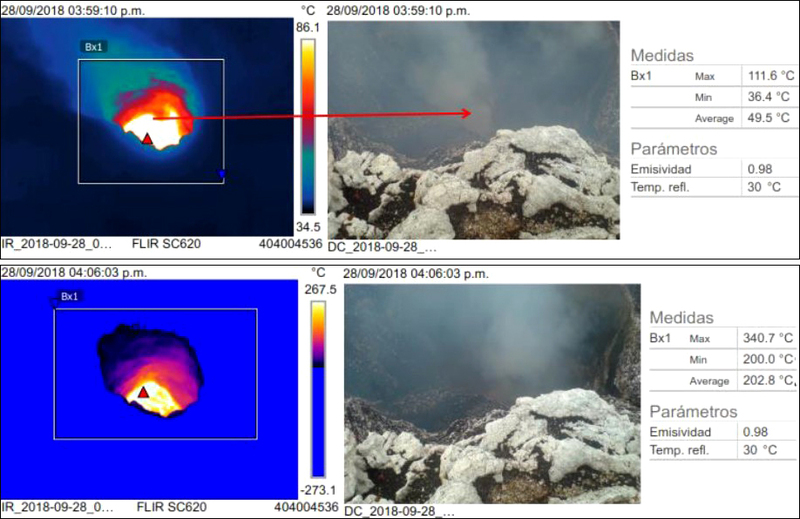 FLIR (forward-looking infrared) and visible images of the Santiago crater at Masaya showing fumarole temperatures. The scale in the center shows the range of temperatures in the FLIR images. Courtesy of INETER (September 2018 report). Figure 67. Sentinel-2 thermal satellite images showing the heat signature from the active lava lake at Masaya during August-October 2018. The lava lake is visible (bright yellow-orange) and a gas-and-steam plume is visible traveling towards the SW. Thermal (urban) satellite images (bands 12, 11, 4) courtesy of Sentinel Hub Playground. Overall, activity from May through October 2018 was relatively quiet with continued lava lake activity. The thermal energy detected by the MIROVA algorithm showed fluctuations but were consistent (figure 68). The MODVOLC algorithm for near-real-time thermal monitoring of global hotspots detected 4-8 anomalies per month for this period, which is lower than previous years (figure 69). Figure 68. Middle infrared MODIS thermal anomalies at Masaya for April through October 2018. The data show relatively constant thermal activity related to the persistent lava lake. Courtesy of MIROVA. Figure 69. 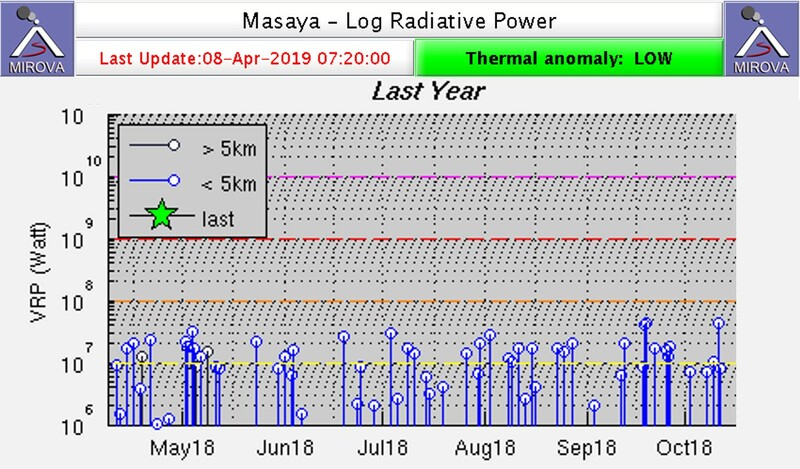 Thermal alerts for Masaya in May through October 2018. Courtesy of HIGP - MODVOLC Thermal Alerts System. Geologic Background. Masaya is one of Nicaragua's most unusual and most active volcanoes. It lies within the massive Pleistocene Las Sierras pyroclastic shield volcano and is a broad, 6 x 11 km basaltic caldera with steep-sided walls up to 300 m high. The caldera is filled on its NW end by more than a dozen vents that erupted along a circular, 4-km-diameter fracture system. The twin volcanoes of Nindirí and Masaya, the source of historical eruptions, were constructed at the southern end of the fracture system and contain multiple summit craters, including the currently active Santiago crater. A major basaltic Plinian tephra erupted from Masaya about 6500 years ago. Historical lava flows cover much of the caldera floor and have confined a lake to the far eastern end of the caldera. A lava flow from the 1670 eruption overtopped the north caldera rim. Masaya has been frequently active since the time of the Spanish Conquistadors, when an active lava lake prompted attempts to extract the volcano's molten "gold." Periods of long-term vigorous gas emission at roughly quarter-century intervals cause health hazards and crop damage. Information Contacts: Instituto Nicaragüense de Estudios Territoriales (INETER), Apartado Postal 2110, Managua, Nicaragua (URL: http://webserver2.ineter.gob.ni/vol/dep-vol.html); Sentinel Hub Playground (URL: https://www.sentinel-hub.com/explore/sentinel-playground); Hawai'i Institute of Geophysics and Planetology (HIGP) - MODVOLC Thermal Alerts System, School of Ocean and Earth Science and Technology (SOEST), Univ. of Hawai'i, 2525 Correa Road, Honolulu, HI 96822, USA (URL: http://modis.higp.hawaii.edu/); MIROVA (Middle InfraRed Observation of Volcanic Activity), a collaborative project between the Universities of Turin and Florence (Italy) supported by the Centre for Volcanic Risk of the Italian Civil Protection Department (URL: http://www.mirovaweb.it/). 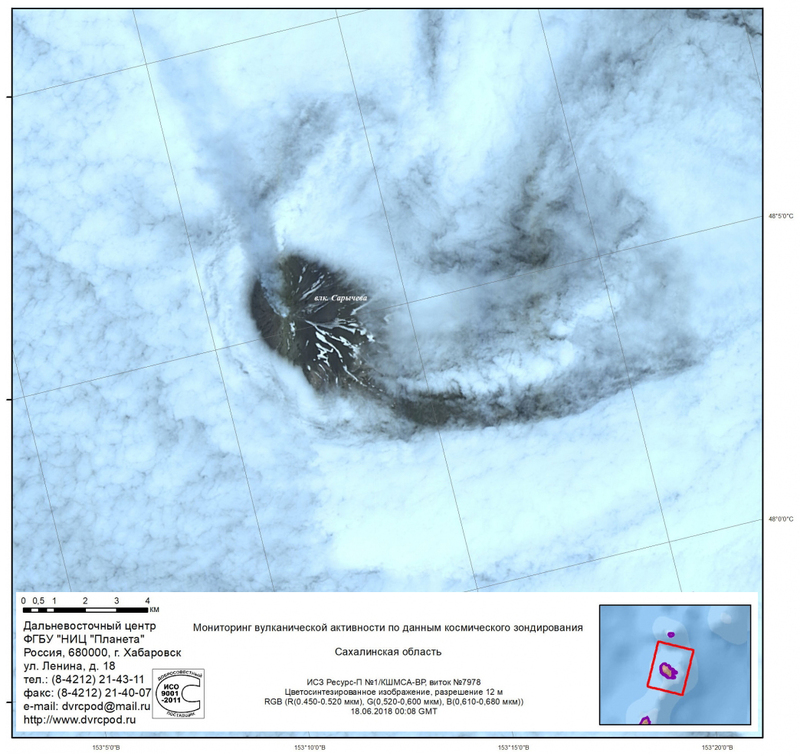 Located on Matua Island in the central Kurile Islands, Russia, Sarychev Peak (figures 19 and 20) had a significant eruption in June-July 2009 (BGVN 34:06, 35:09). Prior to this, a 1946 eruption resulted in the crater with a diameter and depth of approximately 250 m, with steep, sometimes overhanging crater walls. The N crater wall may have collapsed after a 1960 eruption, based on eyewitness accounts. A 1976 eruption included strong emissions and lava flows which resulted in a crater diameter of approximately 200 m and a floor 50-70 m below the rim. The eruption on 11-16 June 2009 encompassed more than ten large explosions, resulting in pyroclastic flows and ash plumes. The area of island covered by the June 2009 pyroclastic flows was more than 8 km2 (BGVN 34:06). Monitoring reports come from the Kamchatkan Volcanic Eruption Response Team (KVERT) and the Sakhalin Island Volcanic Eruption Response Team (SVERT). Figure 19. Photo looking into the crater of Sarychev Peak from the crater rim on 27 June 2017. Courtesy of V. Gurianov, Institute of Volcanology and Seismology FEB, RAS, KVERT. Figure 20. Sentinel-2 satellite image (natural color, bands 4, 3, 2) of Sarychev Peak on 8 September 2017. Courtesy of Sentinel Hub Playground. Thermal anomalies were noted by the NOAA Cooperative Institute for Meteorological Satellite Studies over a period of five hours on 14 October 2017 in satellite data from Terra MODIS, S-NPP VIIRS, and Himawari-8; a plume of unknown composition accompanied the anomaly. A smaller thermal anomaly was present on 12 October, but not seen the following day during favorable viewing conditions. Another thermal anomaly was reported by SVERT on 21 October; views on other days that week of 17-23 October were obscured by clouds. On 7 November gas emissions and an elongated area of snow melt and potential thermal signature was visible on the N flank of the volcano (figure 21). On 8 and 13 November steam emissions were reported by SVERT and cloud cover prevented additional observations. Figure 21. Sentinel-2 satellite images of Sarychev Peak on 7 November 2017. Top image (natural color, bands 4, 3, 2) shows a white plume rising from the summit crater and a dark area extending about 1.25 km NW on the snow-covered slopes. 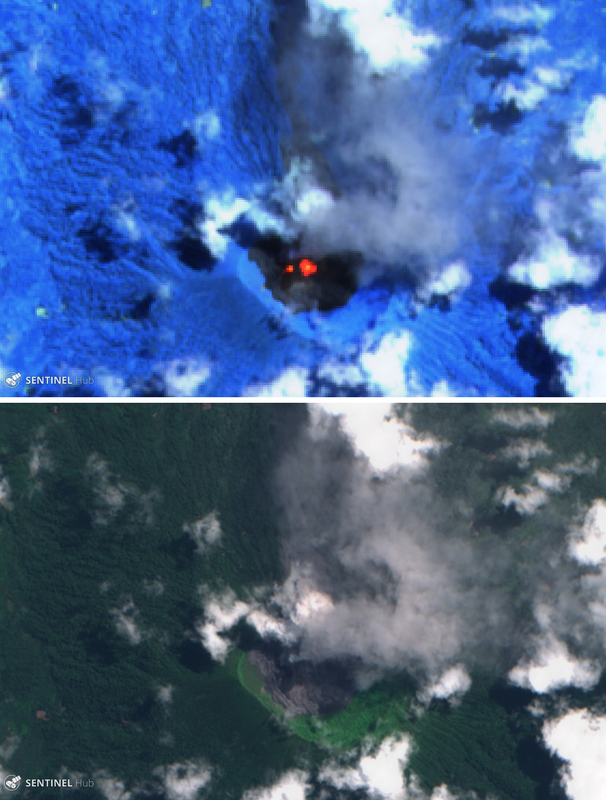 Bottom image (atmospheric penetration, bands 12, 11, 8A) shows hot areas (in orange) of volcano material near the summit within the dark area seen in visible imagery. Courtesy of Sentinel Hub Playground. The volcano was usually cloud-covered after mid-November 2017 through mid-February 2018. A small white plume seen in Sentinel-2 imagery on 20 February 2018 was not accompanied by a noticeable thermal anomaly, and the island appeared completely snow-covered. No activity of any kind was seen on the next cloud-free images taken on 4 and 11 May 2018, when the summit crater was filled with snow. KVERT noted in a September report that there had been a thermal anomaly periodically observed after 7 May 2018. Fumarolic plumes were visible on 5 and 18 June 2018 (figure 22). Thermal anomalies were present on 8 and 11-12 September. Moderate explosions were reported during 11-15 September 2018, with ash emissions rising 3-4 km. On 14 September ash plumes drifted as far as 120 km NNE and the Aviation Color Code was raised to Orange. Explosions on 17 September generated ash plumes that rose as high as 4.5 km and drifted 21 km NE. Additional ash plumes identified in satellite images drifted 265 km E during 17-18 September. 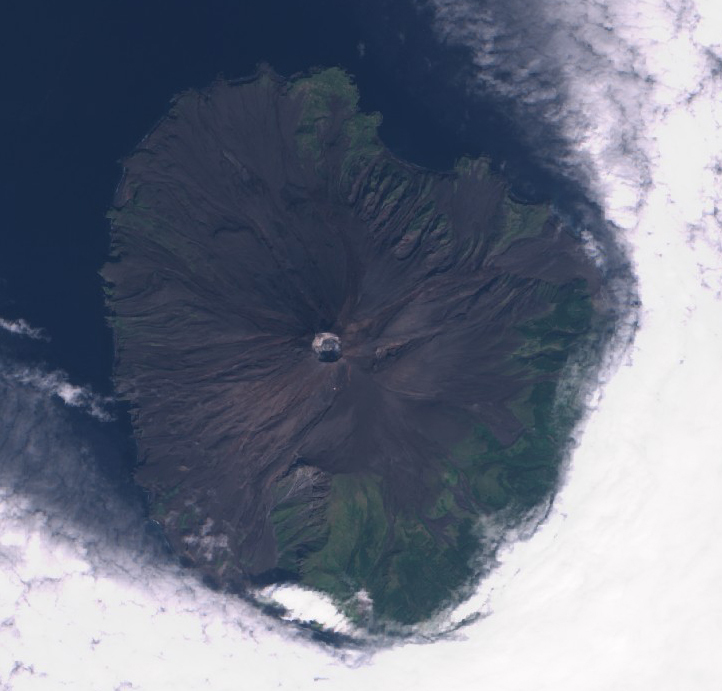 The eruption continued through 21 September, and a thermal anomaly was again visible on 22 September. Figure 22. Fumarolic activity at Sarychev Peak on 18 June 2018. Courtesy of FEC SRC Planeta, Institute of Volcanology and Seismology FEB RAS, KVERT. Based on Tokyo VAAC data and satellite images, KVERT reported that at 1330 on 10 October 2018 an ash plume reached 1.7-2 km altitude and drifted 95 km E. SVERT reported that on 15 October an ash plume rose to 2.1 km altitude and drifted 65-70 km E. KVERT reported that a thermal anomaly was also identified in satellite images on 15 October. No further activity was seen through the end of October. Thermal anomalies identified in MODIS data by the MIROVA system during October 2016-October 2018 occurred intermittently during the summer months each year (figure 23). However, most of those events were low-power and located several kilometers from the crater, so the heat source is unclear. Figure 23. 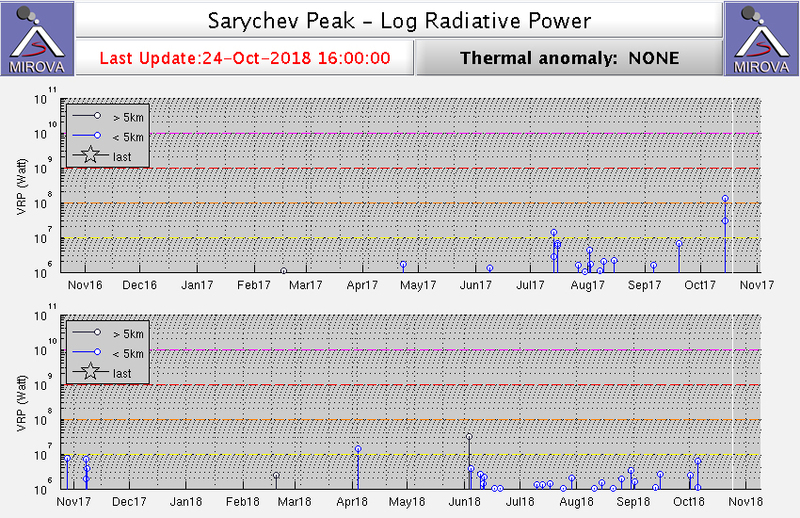 Thermal anomalies detected by the MIROVA system using MODIS data at Sarychev Peak for the year ending 18 October 2017 (top) and ending 24 October 2018 (bottom), plotted as log radiative power. Most of the events shown were located several kilometers from the summit crater. Courtesy of MIROVA. Geologic Background. Sarychev Peak, one of the most active volcanoes of the Kuril Islands, occupies the NW end of Matua Island in the central Kuriles. The andesitic central cone was constructed within a 3-3.5-km-wide caldera, whose rim is exposed only on the SW side. A dramatic 250-m-wide, very steep-walled crater with a jagged rim caps the volcano. The substantially higher SE rim forms the 1496 m high point of the island. Fresh-looking lava flows, prior to activity in 2009, had descended in all directions, often forming capes along the coast. Much of the lower-angle outer flanks of the volcano are overlain by pyroclastic-flow deposits. Eruptions have been recorded since the 1760s and include both quiet lava effusion and violent explosions. Large eruptions in 1946 and 2009 produced pyroclastic flows that reached the sea. Information Contacts: Sakhalin Volcanic Eruptions Response Team (SVERT), Institute of Marine Geology and Geophysics (IMG&G) Far East Division Russian Academy of Sciences (FED RAS), 1B Science St., Yuzhno-Sakhalinsk, 693022, Russia (URL: http://www.imgg.ru/); Kamchatka Volcanic Eruptions Response Team (KVERT), Far Eastern Branch, Russian Academy of Sciences, 9 Piip Blvd., Petropavlovsk-Kamchatsky, 683006, Russia (URL: http://www.kscnet.ru/ivs/kvert/); NOAA, Cooperative Institute for Meteorological Satellite Studies (CIMSS), Space Science and Engineering Center (SSEC), University of Wisconsin-Madison, 1225 W. Dayton St. Madison, WI 53706, (URL: http://cimss.ssec.wisc.edu/); MIROVA (Middle InfraRed Observation of Volcanic Activity), a collaborative project between the Universities of Turin and Florence (Italy) supported by the Centre for Volcanic Risk of the Italian Civil Protection Department (URL: http://www.mirovaweb.it/); Sentinel Hub Playground (URL: https://www.sentinel-hub.com/explore/sentinel-playground). Suwanosejima, an andesitic stratovolcano in Japan's northern Ryukyu Islands, was intermittently active for much of the 20th century, producing ash plumes, Strombolian explosions, and ash deposits. Continuous activity since October 2004 has produced intermittent explosions, generating ash plumes in most months that rise hundreds of meters above the summit to altitudes between 1 and 3 km. Ongoing activity for the second half of 2018 is covered in this report with information provided by the Japan Meteorological Agency (JMA) and the Tokyo Volcanic Ash Advisory Center (VAAC). 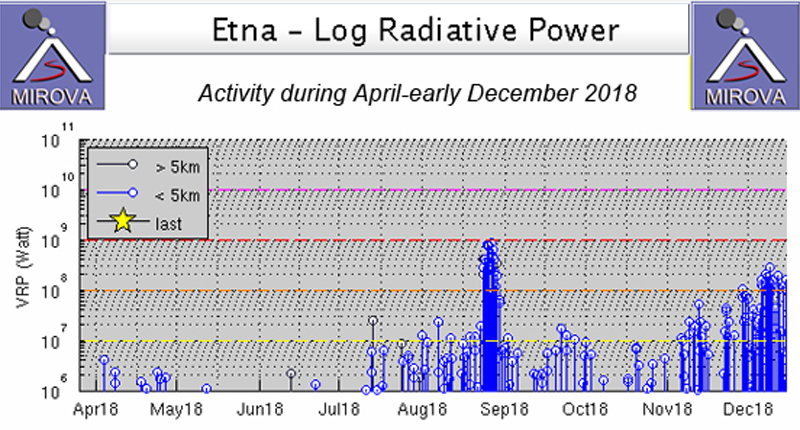 Activity during July-December 2018 was intermittent with explosions reported twice in September and 21 times during November. Incandescent activity was observed a few times each month, increasing significantly during November. Thermal data support a similar pattern of activity; the MIROVA thermal anomaly graph indicated intermittent activity through the period that was most frequent during October and November (figure 33). MODVOLC thermal alerts were issued once in September (9), three times in October (7, 21), and four times on 14 and 15 November. Figure 33. MIROVA thermal data for Suwanosejima from 7 February through December 2018 indicated intermittent activity at the summit that increased to more significant activity during October and November before declining by the end of the year. Courtesy of MIROVA. There were no explosions at Suwanosejima during July or August 2018; steam plumes rose 900-1,000 m above the crater rim and incandescence was intermittently observed on clear nights. 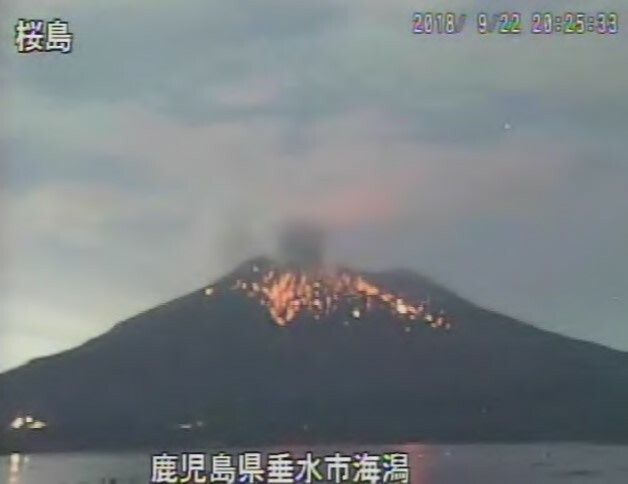 During September incandescence was also observed at night; in addition, explosions were reported on 12 and 13 September, with ash plumes rising 1,100 m above the crater rim. October was again quiet with no explosions, only steam plumes rising 800 m, and occasional incandescence at night, although thermal activity increased (figure 33). More intense activity resumed during November 2018 with 21 explosions reported. On 9 and 14 November tephra was ejected up to 700 m from the Mitake crater. The Tokyo VAAC reported an ash plume visible in satellite imagery at 2.4 km altitude moving E on 14 November. The next day, a plume was reported at 2.7 km altitude drifting NW but it was not visible in satellite imagery. 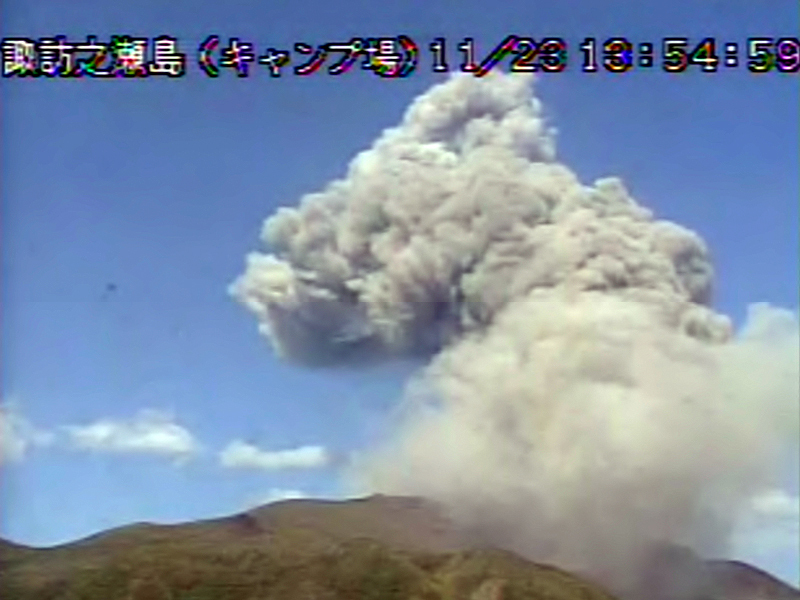 JMA reported gray ash plumes that rose up to 2,000 m above the crater rim on 16 and 23 November (figure 34). The ash plume on 23 November was visible in satellite imagery drifting N at 2.7 km altitude. On 30 November the Tokyo VAAC reported an ash plume visible in satellite data drifting SE at 2.4 km altitude. Incandescence was often observed at night from the webcams throughout the month. Ashfall was confirmed in the village 4 km SSW on 14, 17, and 23 November, and sounds were reported on 20 November. Figure 34. Ash plumes rose 2,000 m above the crater rim at Suwanosejima on 23 November 2018 as seen with the 'campsite' webcam. Courtesy of JMA (Volcanic activity commentary (November, 2018) of Suwanose Island). During December 2018, no explosive eruptions were reported, but an ash plume rose 1,800 m above the summit on 26 December. Incandescence was observed on clear nights in the webcam. Throughout 2018, a total of 42 explosive events were reported; 21 of them occurred during November (figure 35). Figure 35. Eruptive activity at Suwanosejima during 2018. Black bars represent heights of steam, gas, or ash plumes in meters above crater rim (left axis), gray volcanoes along the top represent explosions, usually accompanied by ash plumes, red volcanoes represent large explosions with ash plumes, orange diamonds indicate incandescence observed in webcams. Courtesy of JMA (Volcanic activity of Suwanose Island in 2018). Information Contacts: Japan Meteorological Agency (JMA), Otemachi, 1-3-4, Chiyoda-ku Tokyo 100-8122, Japan (URL: http://www.jma.go.jp/jma/indexe.html); Tokyo Volcanic Ash Advisory Center (VAAC), 1-3-4 Otemachi, Chiyoda-ku, Tokyo, Japan (URL: http://ds.data.jma.go.jp/svd/vaac/data/). 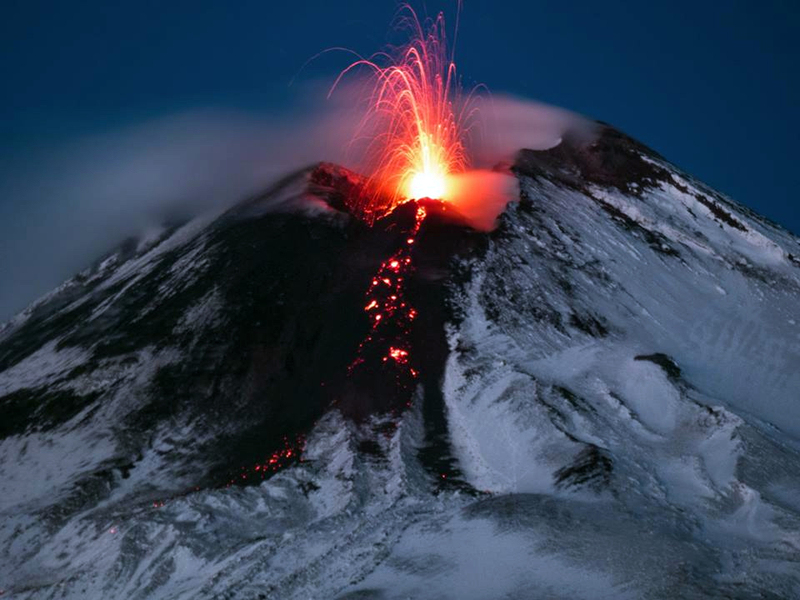 Italy's Mount Etna on the island of Sicily has had historically recorded eruptions for the past 3,500 years and has been erupting continuously since September 2013 through at least November 2018. Lava flows, explosive eruptions with ash plumes, and Strombolian lava fountains commonly occur from its summit areas that include the Northeast Crater (NEC), the Voragine-Bocca Nuova (or Central) complex (VOR-BN), the Southeast Crater (SEC) (formed in 1978), and the New Southeast Crater (NSEC) (formed in 2011). A new crater, referred to as the "cono della sella" (saddle cone), emerged during early 2017 in the area between SEC and NSEC and has become the highest part of the SEC-NSEC complex. Activity during late 2017 and early 2018 consisted mostly of sporadic Strombolian activity with infrequent minor ash emissions from multiple vents at various summit craters. Lava flow activity resumed in late August 2018 and again in late November and is covered in this report with information provided primarily by the Osservatorio Etneo (OE), part of the Catania Branch of Italy's Istituo Nazionale di Geofisica e Vulcanologica (INGV). After several months of low-level activity in early 2018, increases in Strombolian activity at several vents began in mid-July (BGVN 43:08). This was followed by new lava flows emerging from the saddle cone and the E vent of the NSEC complex in late August. Discontinuous low-intensity Strombolian activity and intermittent ash emissions were reported from multiple vents at various summit craters during September through November. In late November, renewed Strombolian activity and a new, small flow emerged from a small scoria cone inside the E vent of the NSEC crater and persisted through the end of the month. The MIROVA thermal anomaly correspond to ground observations of increased thermal activity at Etna beginning in mid-July, peaking in late August, and increasing again at the end of November 2018 (figure 222). Figure 222. MIROVA thermal anomaly graph for Etna from April through early December 2018 shows the increases in thermal activity from lava flows and increased Strombolian activity in late August and late November. Courtesy of MIROVA. Low-energy Strombolian activity resumed at both of the Bocca Nuova BN-1 vents as well as the vents in the Northeast Crater (NEC) during the second week of July 2018 and continued throughout the month. The activity from BN-1 was nearly continuous, but not always visible; occasionally, lava fragments rose 100 m and could be seen outside of the crater rim. Intermittent ash emissions accompanied the Strombolian activity. Activity at NEC was characterized by strong and prolonged explosions (up to several tens of seconds), sometimes with reddish-brown ash emissions (figure 223). Three vents on the floor of NEC continued to widen due to collapse of the inner walls. A seismic swarm on 18-19 July was located between 4 and 9 km depth. Figure 223. Ash emissions from the Northeast Crater of Etna on a) 27 July and b) 28 July 2018 rose a few tens of meters and quickly dispersed. 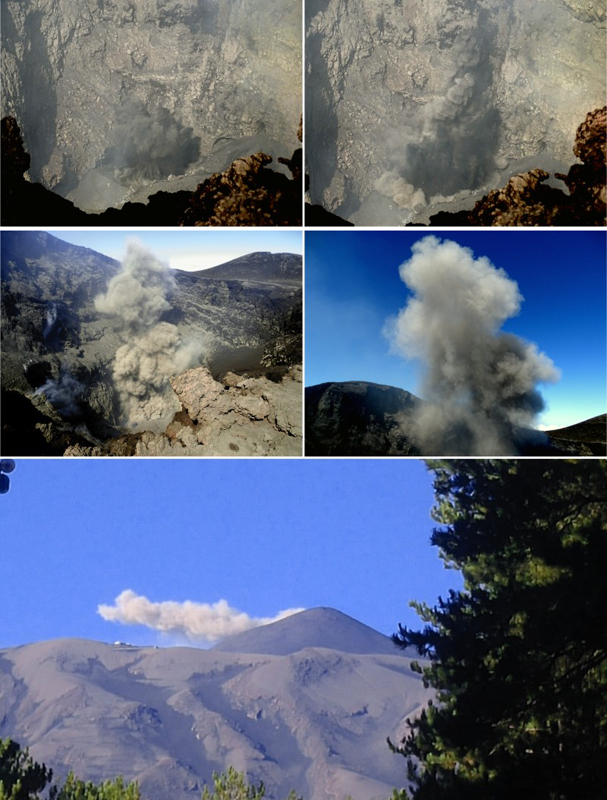 Left image by INGV personnel, right image by volcanology guide Francesco Ciancitto. Courtesy of INGV (Rep. 31/2018, ETNA, Bollettino Settimanale, 23/07/2018 - 29/07/2018, data emissione 31/07/2018). During a field inspection on 30 July INGV personnel noted activity at the three vents at the bottom of Northeast Crater; the farthest west produced ash emissions, the center produced steam, and the vent under the NE crater wall produced Strombolian activity that sent ejecta as high as the crater rim. Frequent ash emissions from NEC were observed on 3, 4, and 5 August. During the first week of August 2018 Strombolian activity also continued at BN-1 (figure 224). The webcam at Montagnola (EMOH) recorded incandescence at night from Bocca Nuova. Figure 224. Activity during the first half of August 2018 at Etna was concentrated at BN-1, the Northeast Crater (NEC), and the E vent of the New Southeast Crater (NSEC), shown in red. Courtesy of INGV (Rep. 33/2018, ETNA, Weekly Bulletin, 08/06/2018 - 12/08/2018, issue date 08/14/2018). After several months of calm, explosive activity also resumed at the E vent of the of the New Southeast Crater, high on the E flank, in early August. An explosion in the early morning of 1 August 2018 generated a gray-brown ash plume that rose several hundred meters above the summit (figure 225). Smaller emissions occurred throughout the day, and the EMOH camera recorded sporadic Strombolian explosions at night, which continued through the first week of August. Figure 225. After several months of calm, a resurgence of explosive activity was observed at the E vent (formed 25 November 2015) on the high E flank of the New Southeast Crater. 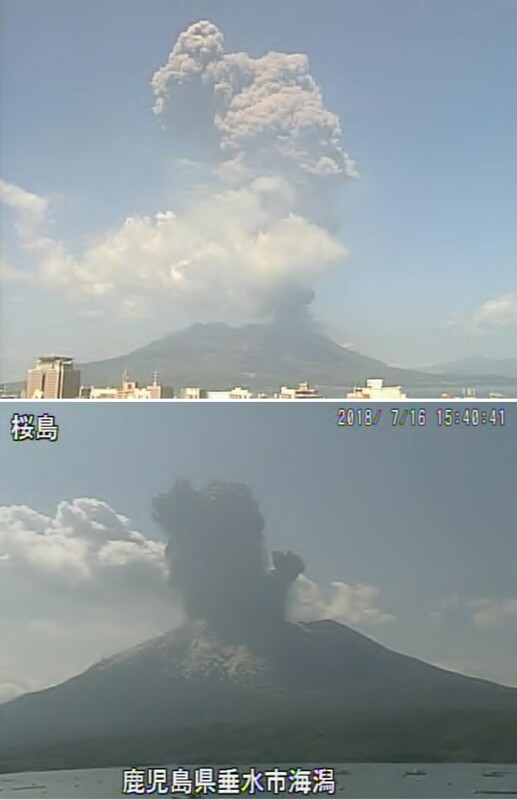 The activity started with an explosion at 0408 UTC (= local time -2 hours), and generated a gray-brown ash plume that rose several hundred meters above the top of the volcano (a, b). 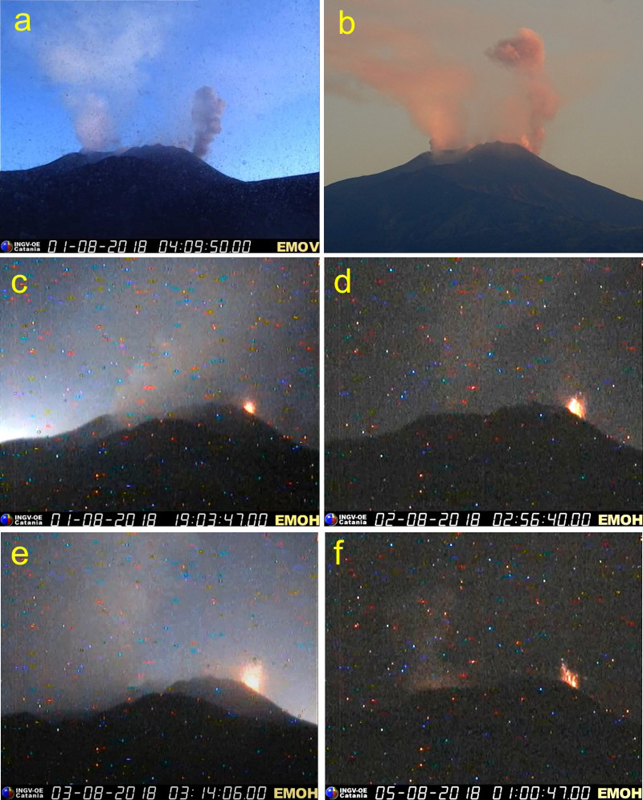 In the following hours other smaller ash emissions occurred, and in the evening, the EMOH camera recorded sporadic Strombolian explosions (c). This activity continued, with fluctuations in the frequency and magnitude of the explosions, for the rest of the month (d, e, f). Courtesy of INGV (Rep. 32/2018, ETNA, Bollettino Settimanale, 30/07/2018 - 05/08/2018, data emissione 07/08/2018). Similar activity at BN-1, NEC, and the reactivated vent at NSEC continued through the second and third weeks of August. On 16 August 2018 a new vent opened in the BN-2 area on the E side of the Voragine (inactive since December 2015) and exhibited both degassing and Strombolian activity (figure 226). During that week Strombolian activity also continued at the NEC, but activity became more sporadic at the E vent of NSEC. During the last week of August, Strombolian activity and intense degassing continued in the western sector of Bocca Nuova (BN-1). Occasionally, lapilli fragments a few centimeters in diameter were ejected onto the S rim of the crater. Strombolian activity also continued from multiple vents at the bottom of NEC. The frequency and intensity of explosions was variable and increased significantly during 22 August, ejecting coarse pyroclastic material outside the crater rim. Figure 226. 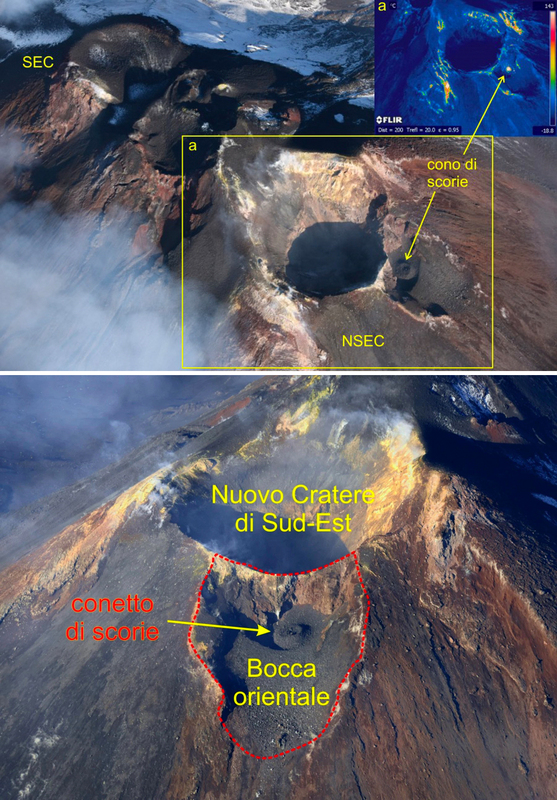 The crater floor of Bocca Nuova at Etna on 16 and 17 August 2018 with thermal (a) and visible (b) images. The incandescent areas are highlighted with colors ranging from yellow to red and white in the thermal image. BN-1 (reactivated in November 2016) is in the foreground, and vent BN-2, which re-opened on 16 August in the south-eastern sector of the Bocca Nuova, is in the back (upper right). Thermal image by Francesco Ciancitto, photograph by Marco Neri. Courtesy of INGV (L'Etna non va in vacanza: aumenta di intensità l'attività eruttiva sommitale, 23 Agosto 2018, INGV Blog). Beginning on 23 August 2018 about 1800 UTC, activity resumed at the saddle cone located between the old cone of the Southeast Crater (SEC) and the new cone (NSEC). Strombolian activity, initially modest, quickly became more intense, producing almost continuous explosions with the launch of coarse ejecta up to a height of 100-150 m. At 1830 UTC, while Strombolian explosions of modest intensity were also taking place at the E vent of NSEC, a small lava flow emerged from the E vent and traveled a few hundred meters E towards the Valle del Bove. Shortly after 1830 UTC another lava overflow was also observed moving N from the saddle cone (figures 227 and 228). Figure 227. Strombolian ejecta rose 100 m from the cono della sella (saddle cone) at the New Southeast Crater of Etna and lava flowed from both the E vent (left) and N from the saddle cone (right), shortly before midnight on 23 August 2018. Photo by Boris Behncke, courtesy of INGV blog 25 August 2018 (L'Etna fa gli straordinari: attività eruttiva al Nuovo Cratere di Sud-Est). Figure 228. 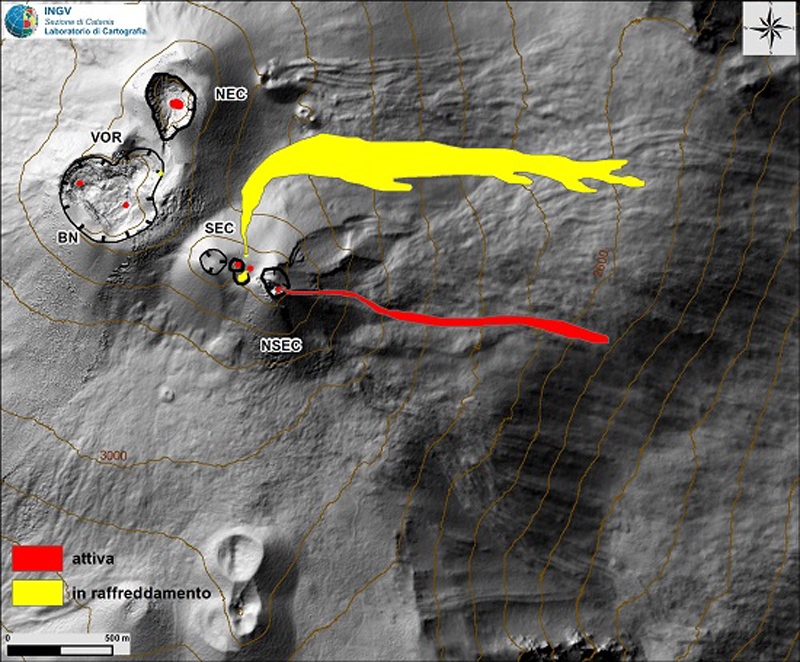 Map of the summit crater area (DEM 2014, Aerogeophysics Laboratory - Rome Section 2, modified). BN = Bocca Nuova; VOR = Voragine; NEC = Northeast Crater; SEC = Southeast Crater; NSEC = New Southeast Crater. The yellow dots indicate the position of the degassing vents and those in red are the vents with Strombolian activity. The map also shows the flows produced by the saddle cone and the E vent of NSEC through 27 August 2018. Courtesy of INGV (Rep. N° 35/2018, ETNA, Bollettino Settimanale, 20/08/2018 - 26/08/2018, data emissione 28/08/2018). Strombolian explosions of moderate intensity continued throughout the night from the saddle cone. The following morning (24 August) a small lava overflow emerged from the vent and stopped after traveling a few tens of meters towards the S flank of the NSEC cone (figure 228, small orange flow within saddle, and figure 229b). The Strombolian activity was accompanied by an abundant and continuous emission of ash, whichformed a small plume that rose a few hundred meters from the vent (figure 229c). The Strombolian activity at the saddle cone decreased gradually on 25 August. Figure 229. Eruptive activity at Etna during 23-24 August 2018. a) 23 August shortly before midnight; Strombolian activity from the saddle cone and lava flows from the E vent of the NSEC (white arrow) and from the cone of the saddle northwards (red arrow). Photo by B. Behncke taken from Fornazzo. b) 24 August, Strombolian activity and small lava overflow southward taken by the thermal camera of La Montagnola. c) 24 August, ash emitted during the Strombolian activity from the cone of the saddle, taken by the visible camera of La Montagnola. Courtesy of INGV (Rep. 35/2018, ETNA, Bollettino Settimanale, 20/08/2018 - 26/08/2018, data emissione 28/08/2018). Strombolian activity was continuing on 27 August 2018 at NSEC, and the flow to the N into the Valle del Leone began cooling after lava stopped feeding it that evening. The same day, a new lava overflow emerged from the E vent of NSEC (figure 230) and flowed E towards the Valle del Bove for about 24 hours (figure 231). Figure 230. 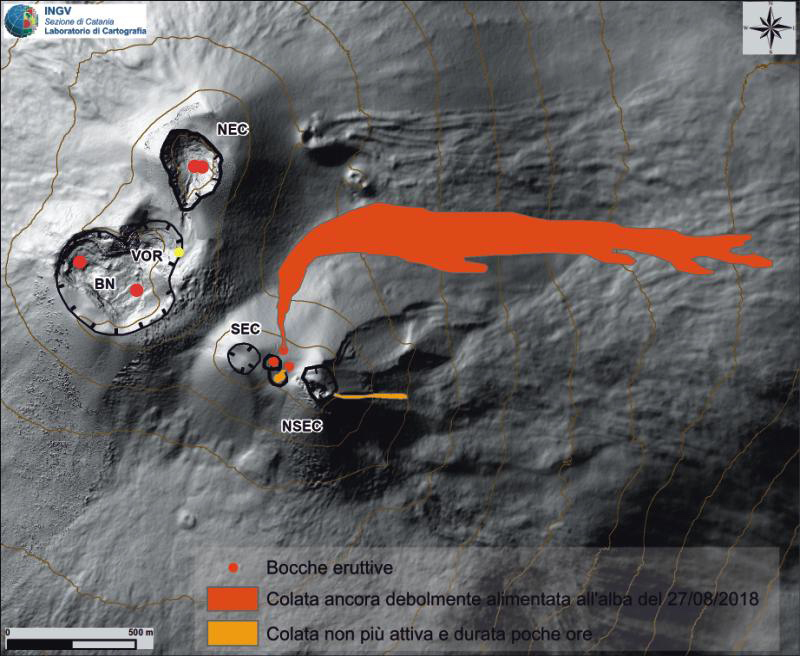 Map of the summit crater area of Etna (DEM 2014, Aerogeophysics Laboratory - Rome Section 2, modified). BN = Bocca Nuova; VOR = Voragine; NEC = Northeast Crater; SEC = Southeast Crater; NSEC = New Southeast Crater. The yellow dots are degassing vents and those in red have Strombolian activity. The map also shows the flows produced by NSEC during the last two weeks of August 2018. The yellow flow was cooling by 27 August when the new red flow emerged from the E vent of NSEC and lasted for about 24 hours. Courtesy of INGV (Rep. 36/2018, ETNA, Bollettino Settimanale, 27/08/2018 - 02/09/2018, data emissione 04/09/2018). Figure 231. A thermal image taken by Pizzi Deneri on 27 August 2018 at Etna shows the two flows on the flanks of NSEC. View is from the N. The flow labelled in red flows E from the E vent, and the other flow travels N from the Cono della sella (saddle cone) into the Valle del Leone and then moves east. Courtesy of INGV (Rep. 36/2018, ETNA, Bollettino Settimanale, 27/08/2018 - 02/09/2018, data emissione 04/09/2018). Discontinuous Strombolian activity continued from NSEC after the effusive activity ended in late August. 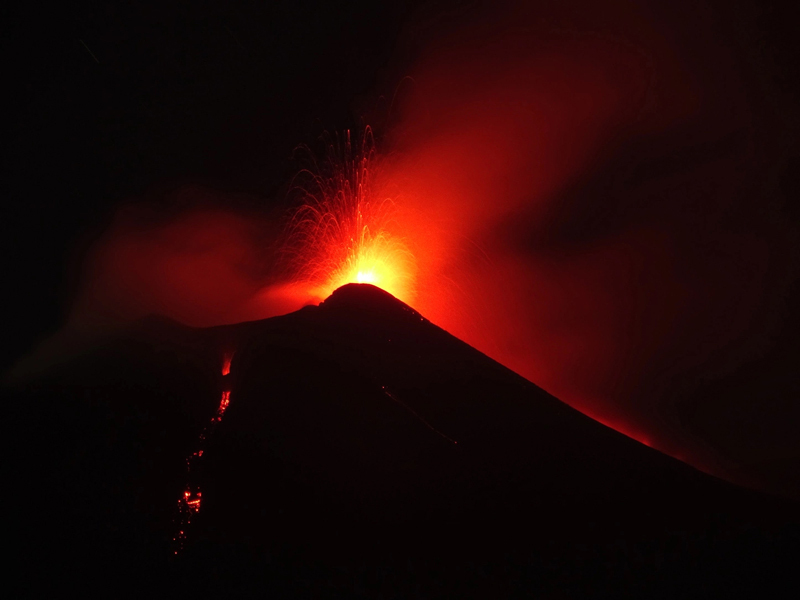 Several loud explosions from NSEC were reported by people living near the E flank of Etna during the first week of September. Strombolian activity, modest ash emissions, and significant gas emissions were also produced by BN-1; BN-2 exhibited only continuous degassing activity. Explosive activity declined during the second week of September. Discontinuous low-intensity Strombolian activity and intermittent ash emissions from Bocca Nuova, New Southeast Crater, and Northeast Crater characterized activity for the remainder of September. 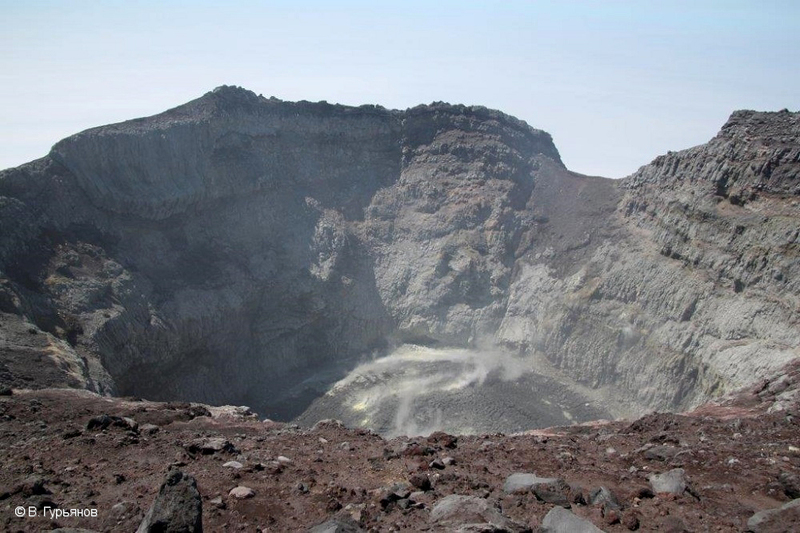 During the last week of the month, NEC produced frequent gray-brown ash emissions from a vent located in the western part of the crater floor, and included jets of ash, blocks, and volcanic bombs (figure 232). Figure 232. Ash emissions from Etna's Northeast Crater in late September 2018. The four top images are explosions from a vent at the bottom of NEC on 24 September 2018; the bottom image is one of the many ash emissions observed on 30 September. Courtesy of INGV (Rep. N° 40/2018, ETNA, Bollettino Settimanale, 24/09/2018 - 30/09/2018, data emissione 02/10/2018). Discontinuous low-intensity Strombolian activity and intermittent ash emissions from the Bocca Nuova, the New Southeast Crater, and Northeast Crater characterized activity during all of October 2018. 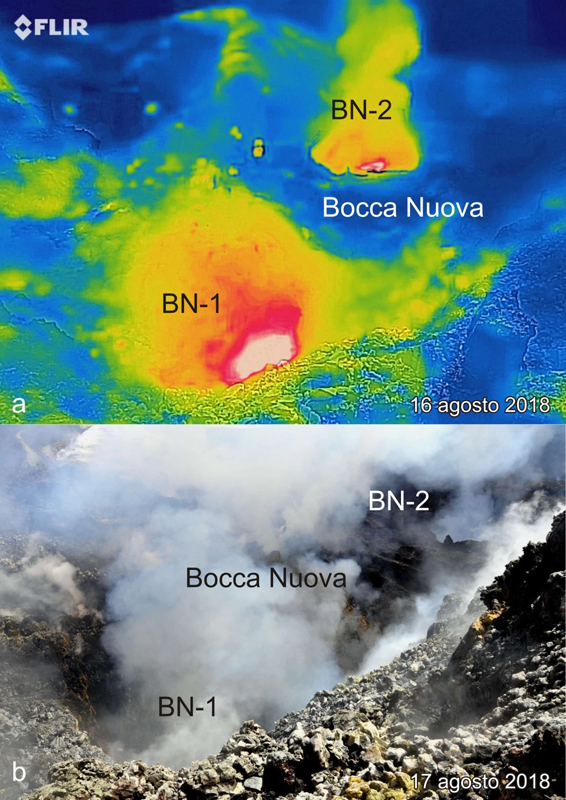 Two vents remained active at the bottom of Bocca Nuova (BN-1). During a visit on 16 October, INGV-OE geologists noted that the northernmost vent produced nearly continuous Strombolian activity with frequent explosions; occasionally fragments exceeded the crater rim in height but still fell within the crater. The southernmost vent, on the crater floor about 130 m from the edge, was characterized by explosive activity that produced mainly spattering which covered both the crater floor and walls (figure 233). On 25 October the webcam at Bronte recorded an ash emission from Bocca Nuova that resulted from three closely-spaced explosions. The ash was red and dispersed rapidly to the S causing ashfall near Torre del Filosofo and Rifugio Sapienza. Figure 233. Inside the Bocca Nuova BN-1 crater at Etna on 16 October 2018, two vents were active. 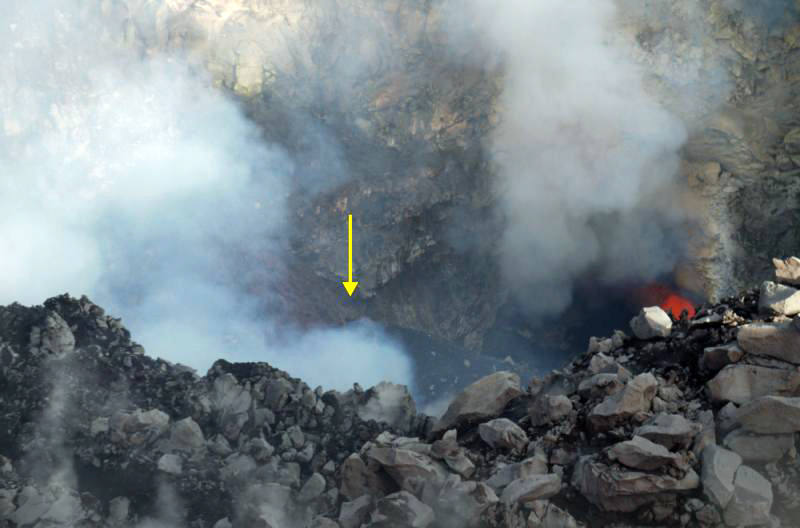 The northernmost vent (yellow arrow) had Strombolian activity; the southernmost vent, visible on the right, produced mostly "spattering". Photo by M. Coltelli, courtesy of INGV (Rep. N° 43/2018, ETNA, Bollettino Settimanale, 15/10/2018 - 21/10/2018, data emissione 23/10/2018). Strombolian activity at NSEC gradually intensified during the first week of November 2018 and was sometimes accompanied by ash emissions that rapidly dispersed, falling mainly near the vent and in the Valle del Bove to the E. Audible explosions from the activity were heard in Zafferana Etnea on the E flank. Several clear views of the summit and details of the active vents were well exposed during an overflight on a clear 9 November day (figure 234). Figure 234. An aerial view of the Etna summit craters taken on a clear 9 November 2018 day with the assistance of the 2nd Coast Guard Core of Catania. View is to the NW. BN = Bocca Nuova; VOR = Voragine; NEC = Northeast Crater; SEC = Southeast Crater; NSEC = New Southeast Crater. Courtesy of INGV (Rep. N° 46/2018, ETNA, Bollettino Settimanale, 05/11/2018 - 11/11/2018, data emissione 13/11/2018). 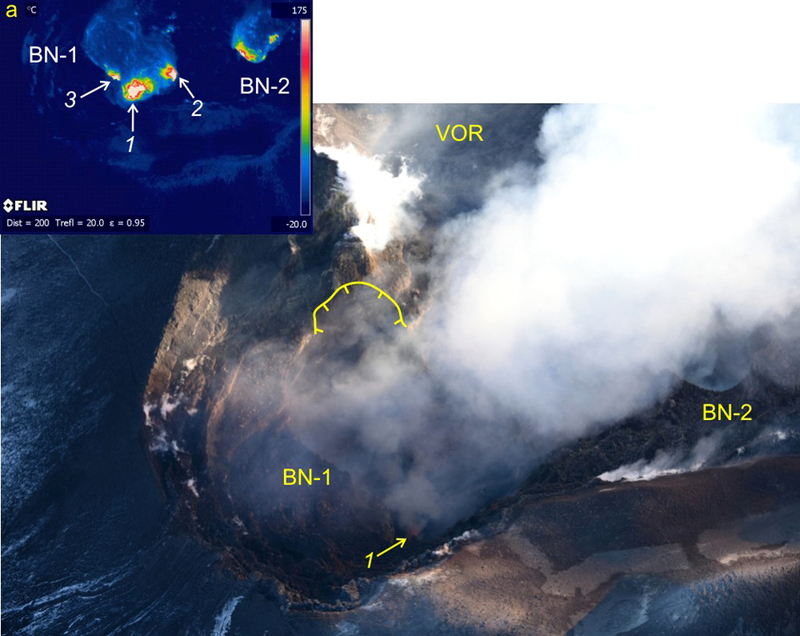 Three vents were visible at BN-1 during the 9 November 2018 overflight (figure 235); continuous Strombolian activity occurred at vent 1, whose fallout of pyroclastic debris remained within the crater; discontinuous Strombolian activity was observed at vent 2 associated with weak, pulsing ash emissions; only degassing activities were observed at vent 3. At BN-2, intense degassing accompanied discontinuous Strombolian activity that was associated with weak pulsating ash emissions, and several high temperature gas emission points. Scientists also observed a collapse on a portion of the northern inner wall of BN-1 from the explosion on 25 October. Figure 235. Aerial view of Bocca Nuova (BN) and Voragine (VOR) at Etna on 9 November 2018 taken with helicopter support of the 2nd Coast Guard Core of Catania. The yellow hatched line indicates the wall of the area that collapsed on 25 October 2018. Inset a) thermal image of Bocca Nuova showing the structure of the three eruptive vents within BN-1 and the eruptive vent within the BN-2. Courtesy of INGV (Rep. N° 46/2018, ETNA, Bollettino Settimanale, 05/11/2018 - 11/11/2018, data emissione 13/11/2018). Modest outgassing continued at Voragine (VOR) from the 7 August 2016 vent near the rim during November. At NEC, continuous and intense Strombolian activity from the crater floor caused pyroclastic ejecta to land outside the crater rim (figure 236). At the NSEC complex, high-temperature anomalies were visible at the NW crater edge, and the E vent of NSEC had a small scoria cone that produced discontinuous Strombolian explosions and minor ash emissions (figure 237). Figure 236. Aerial view of Voragine (VOR) and the Northeast Crater (NEC) at Etna taken on 9 November 2018 with helicopter support of the 2nd Coast Guard Core of Catania. 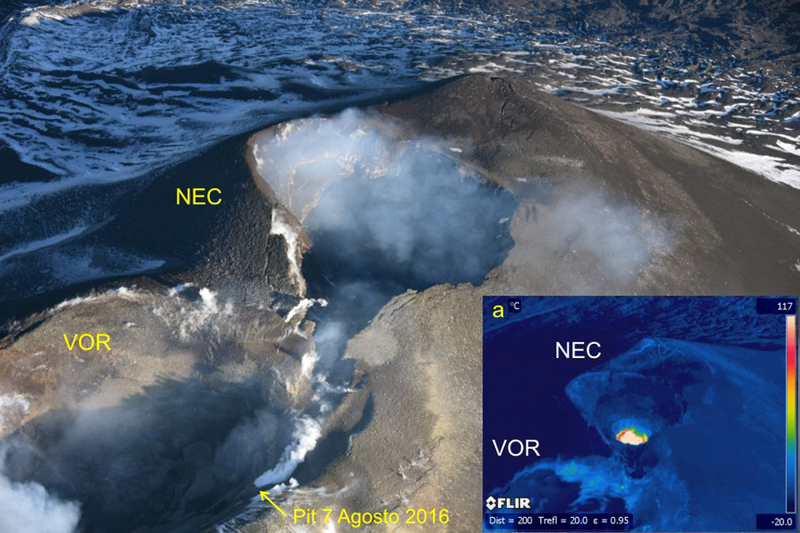 The 7 August 2016 vent at VOR had a vigorous steam emission (yellow arrow). Inset a) thermal image showed the Strombolian activity in the bottom of NEC. Courtesy of INGV (Rep. N° 46/2018, ETNA, Bollettino Settimanale, 05/11/2018 - 11/11/2018, data emissione 13/11/2018). Figure 237. Thermal activity was evident in several places at the SEC-NSEC complex at Etna during the 9 November 2018 overflight with the helicopter of the 2nd Coast Guard Core of Catania (inset a, upper image). The small scoria cone (conetto di scorie) was visible inside the E vent (Bocca orientale) of the New Southeast Crater, seen from the East on 9 November (lower image). Upper image from INGV weekly (Rep. N° 46/2018, ETNA, Bollettino Settimanale, 05/11/2018 - 11/11/2018, data emissione 13/11/2018), lower image by Stefano Branca (INGV-Osservatorio Etneo) from INGV blog (Piccoli coni crescono: aggiornamento sullo stato di attività dell'Etna al 7 dicembre 2018). A seismic swarm with over 40 events affected the W flank of Etna on 20 November 2018; the hypocenters were located between 15 and 27 km depth. A small lava flow also emerged on 20 November from the scoria cone inside the E vent at NSEC. The flow lasted for a few hours and remained inside the E vent. A new flow from the same scoria cone at the NSEC east vent appeared on 26 November accompanied by continued Strombolian activity. The flow remained high on the E flank at an elevation of about 3,200 m. Flow activity continued into the first days of December with frequent incandescent blocks moving down the NSEC E flank (figure 238). 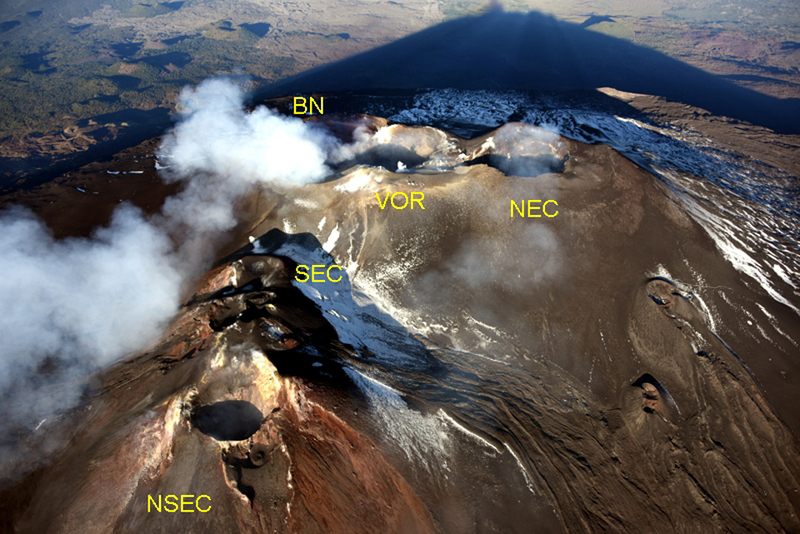 Elsewhere at Etna, Strombolian activity continued accompanied by sporadic and modest ash emissions from Bocca Nuova, the New Southeast Crater and the Northeast Crater through the end of November (figure 239). Figure 238. Strombolian activity and emission of a small lava flow from the E vent of the New Southeast Crater was seen from the E at dawn on 29 November 2018. The lava flow was very short, but the detachment and rolling of numerous incandescent blocks from the front and sides of the flow created the impression that the flow reached the base of the New Southeast Crater cone. The scoria cone inside the E vent grew considerably compared to its size observed on 9 November (figure 237). Photo by Giò Giusa. Courtesy of INGV, INGV Blog (Piccoli coni crescono: aggiornamento sullo stato di attività dell'Etna al 7 dicembre 2018). Figure 239. 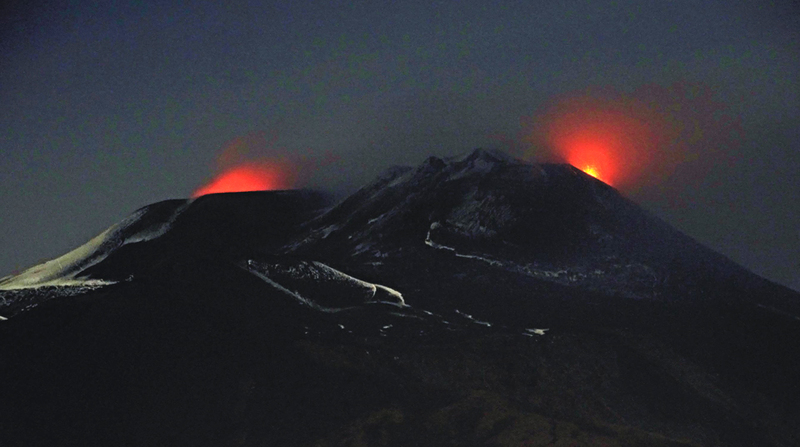 Incandescence from Strombolian activity was visible inside the NSEC (right) and BN (left) craters at Etna on 22 November 2018 as viewed from Tremestieri Etneo. Photo by B. Behncke, courtesy of INGV (Rep. N° 48/2018, ETNA, Bollettino Settimanale, 19/11/2018 - 25/11/2018, data emissione 27/11/2018). Information Contacts: Sezione di Catania - Osservatorio Etneo, Istituto Nazionale di Geofisica e Vulcanologia (INGV), Sezione di Catania, Piazza Roma 2, 95123 Catania, Italy (URL: http://www.ct.ingv.it/it/ ); MIROVA (Middle InfraRed Observation of Volcanic Activity), a collaborative project between the Universities of Turin and Florence (Italy) supported by the Centre for Volcanic Risk of the Italian Civil Protection Department (URL: http://www.mirovaweb.it/). The long-term eruption at Dukono has been characterized by frequent ash explosions through at least March 2018 (BGVN 43:04). The current report shows that this pattern continued through at least September 2018. The data below were provided by the Pusat Vulkanologi dan Mitigasi Bencana Geologi (PVMBG), also known as the Center for Volcanology and Geological Hazard Mitigation (CVGHM), and the Darwin Volcanic Ash Advisory Centre (VAAC). Between April and September 2018 there were about five reports per month about ash plumes. Altitudes generally ranged from 1.4-2.1 km, although 3 km was reported during 2-8 May and 3.4 km was reported during 25-31 July (table 18). Table 18. Monthly summary of reported ash plumes from Dukono for April-September 2018. The direction of drift for the ash plume through each month was highly variable. Data courtesy of the Darwin VAAC and PVMBG. No thermal anomalies at Dukono, based on MODIS satellite instruments analyzed using the MODVOLC algorithm, were detected during the reporting period. The MIROVA (Middle InfraRed Observation of Volcanic Activity) volcano hotspot detection system, also based on analysis of MODIS data, detected a low-power hotspot in early April (about 2.5 km from the volcano) and a possible low-power hotspot in late August 2018 (about 5 km from the volcano). Information Contacts: Pusat Vulkanologi dan Mitigasi Bencana Geologi (PVMBG, also known as Indonesian Center for Volcanology and Geological Hazard Mitigation, CVGHM), Jalan Diponegoro 57, Bandung 40122, Indonesia (URL: http://www.vsi.esdm.go.id/); Darwin Volcanic Ash Advisory Centre (VAAC), Bureau of Meteorology, Northern Territory Regional Office, PO Box 40050, Casuarina, NT 0811, Australia (URL: http://www.bom.gov.au/info/vaac/); Hawai'i Institute of Geophysics and Planetology (HIGP) - MODVOLC Thermal Alerts System, School of Ocean and Earth Science and Technology (SOEST), Univ. of Hawai'i, 2525 Correa Road, Honolulu, HI 96822, USA (URL: http://modis.higp.hawaii.edu/); MIROVA (Middle InfraRed Observation of Volcanic Activity), a collaborative project between the Universities of Turin and Florence (Italy) supported by the Centre for Volcanic Risk of the Italian Civil Protection Department (URL: http://www.mirovaweb.it/). Typical activity at Ulawun consists of sporadic explosions with weak ash plumes. During 2017, sporadic explosions occurred between late June through early November with ash plumes rising no more than 3 km in altitude (BGVN 42:12). This report describes activity between January and September 2018. According to the Darwin Volcanic Ash Advisory Centre (VAAC), a NOTAM (Notice to Airmen) stated that on 8 June 2018 an ash plume rose to an altitude of 2.1 km and drifted W. The Darwin VAAC also reported that a pilot observed an ash plume on 21 September 2018 rising to an altitude of 3.7 km and drifting W. Ash was not confirmed in satellite images, though weather clouds obscured views. On 5 October 2018 the Darwin VAAC identified a steam-and-ash emission in satellite images rising to an altitude of 4.6 km and drifting WSW. It was also reported by ground observers. The Rabaul Volcano Observatory reported that during 1-12 October white, and sometimes light gray, emissions rose from the summit crater; seismicity was low. Geologic Background. The symmetrical basaltic-to-andesitic Ulawun stratovolcano is the highest volcano of the Bismarck arc, and one of Papua New Guinea's most frequently active. The volcano, also known as the Father, rises above the north coast of the island of New Britain across a low saddle NE of Bamus volcano, the South Son. The upper 1000 m is unvegetated. A prominent E-W escarpment on the south may be the result of large-scale slumping. Satellitic cones occupy the NW and E flanks. A steep-walled valley cuts the NW side, and a flank lava-flow complex lies to the south of this valley. Historical eruptions date back to the beginning of the 18th century. Twentieth-century eruptions were mildly explosive until 1967, but after 1970 several larger eruptions produced lava flows and basaltic pyroclastic flows, greatly modifying the summit crater. Information Contacts: Darwin Volcanic Ash Advisory Centre (VAAC), Bureau of Meteorology, Northern Territory Regional Office, PO Box 40050, Casuarina, NT 0811, Australia (URL: http://www.bom.gov.au/info/vaac/); Rabaul Volcano Observatory (RVO), Geohazards Management Division, Department of Mineral Policy and Geohazards Management (DMPGM), PO Box 3386, Kokopo, East New Britain Province, Papua New Guinea. After Vulcanian activity in the latter part of 2009, activity at Langila subsided, with infrequent activity until 2016, when activity increased somewhat through May 2018 (BGVN 34:11, 35:02, 42:01, and 42:09). This pattern of intermittent activity continued through October 2018. No reports were available from the Rabaul Volcano Observatory during the current reporting period (June-October 2018), but volcanic ash warnings were issued by the Darwin Volcanic Ash Advisory Centre (VAAC). Table 6. Reports of ash plumes from Langila during 1 June-30 October 2018 based on analyses of satellite imagery and wind model data. Courtesy of the Darwin VAAC. 07 Jun 2018 3.4 SW Detached from the summit. 10 Jun 2018 2.1 -- Dissipated. Information Contacts: Darwin Volcanic Ash Advisory Centre (VAAC), Bureau of Meteorology, Northern Territory Regional Office, PO Box 40050, Casuarina, NT 0811, Australia (URL:http://www.bom.gov.au/info/vaac/). A significant increase in the number of thermal anomalies at Sangeang Api was recorded during February and June through mid-August 2017, along with a small Strombolian eruption in mid-July that generated an ash plume (BGVN 42:09). The high number of thermal anomalies continued through at least 20 October 2018. The current report summarizes activity between 1 September 2017 and 20 October 2018. The volcano is monitored by the Pusat Vulkanologi dan Mitigasi Bencana Geologi (PVMBG) and Darwin Volcanic Ash Advisory Centre (VAAC). Based on a Volcano Observatory Notice for Aviation (VONA) from PVMBG, on 9 May 2018 a gas emission was observed at 1807 that rose to an altitude of 4,150 m and drifted W. Consequently, the Aviation Color Code was raised from unassigned to Yellow. Clear thermal satellite imagery the next day showed hot material traveling about 500 m SE out of the summit crater and continuing another 500 m down the E flank (figure 18). Figure 18. Sentinel-2 satellite image of Sangeang Api on 10 May 2018. This "Atmospheric penetration" view (bands 12, 11, and 8A) highlights hot material extending more than a kilometer from the vent in the summit crater to the SE and onto the E flank. Courtesy of Sentinel Hub. Based on another VONA from PVMBG, an ash emission at 1338 on 15 October 2018 rose 250 m above the summit and drifted SW, W, and NW. The VONA noted that the ash emission possibly rose higher than what a ground observer had estimated. Seismic data was dominated by signals indicating emissions as well as local tectonic earthquakes. The Aviation Color Code was raised from Yellow to Orange. During the reporting period, MODIS satellite instruments using the MODVOLC algorithm recorded thermal anomalies between 3 and 12 days per month, many of which had multiple pixels. October 2017 had the greatest number of days with hotspots (12), while the lowest number was recorded during December 2017 through February 2018 (3-4 days per month). The vast majority of anomalies issued from the summit; a few were along the E flanks. The MIROVA (Middle InfraRed Observation of Volcanic Activity) volcano hotspot detection system, also based on analysis of MODIS data, recorded numerous hotspots during the previous 12 months through mid-October 2018, except for the second half of January 2018 (figure 19). Almost all recorded MIROVA anomalies were within 5 km of the volcano and of low to moderate radiative power. Figure 19. Thermal anomalies identified by the MIROVA system (Log Radiative Power) at Sangeang Api for the year ending 19 October 2018. Courtesy of MIROVA. Geologic Background. Sangeang Api volcano, one of the most active in the Lesser Sunda Islands, forms a small 13-km-wide island off the NE coast of Sumbawa Island. Two large trachybasaltic-to-tranchyandesitic volcanic cones, 1949-m-high Doro Api and 1795-m-high Doro Mantoi, were constructed in the center and on the eastern rim, respectively, of an older, largely obscured caldera. Flank vents occur on the south side of Doro Mantoi and near the northern coast. Intermittent historical eruptions have been recorded since 1512, most of them during in the 20th century. Volcanic activity at Sheveluch declined during the period of May through October 2018. This decline followed a lengthy cycle of eruptive activities which began in 1999, including pyroclastic flows, explosions, and lava dome growth, as previously reported through April 2018 (BGVN 43:05). 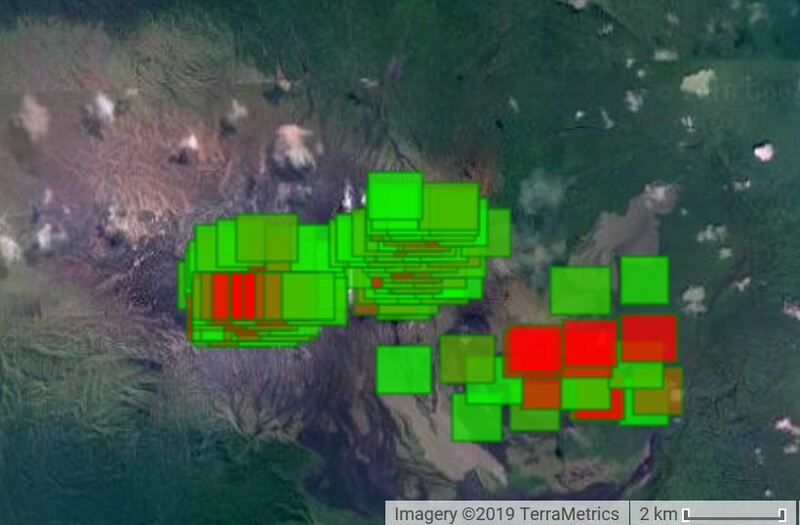 According to the Kamchatka Volcanic Eruption Response Team (KVERT), during this time a thermal anomaly was detected in satellite imagery and two gas-and-steam events were reported in July and October 2018. The Aviation Color Code remained at Orange (the second highest level on a four-color scale). KVERT reported that satellite data showed a plume of re-suspended ash up to 62 km to the SE of the volcano on 18 July 2018. Moderate gas and steam emissions rose from the volcano on 19-26 October 2018. Thermal anomalies were frequently reported by KVERT during May through October 2018. The MIROVA system detected intermittent low-power thermal anomalies during this time. Information Contacts: Kamchatka Volcanic Eruptions Response Team (KVERT), Far East Division, Russian Academy of Sciences, 9 Piip Blvd., Petropavlovsk-Kamchatsky, 683006, Russia (URL: http://www.kscnet.ru/ivs/kvert/); MIROVA (Middle InfraRed Observation of Volcanic Activity), a collaborative project between the Universities of Turin and Florence (Italy) supported by the Centre for Volcanic Risk of the Italian Civil Protection Department (URL: http://www.mirovaweb.it/). The most recent of the previous intermittent weak explosions on Gamalama was on 3 August 2016, which produced an ash plume and ashfall that closed a nearby airport for a day (BGVN 42:03). This report discusses eruptive activity in October 2018. The volcano is monitored by the Pusat Vulkanologi dan Mitigasi Bencana Geologi (PVMBG, also known as Indonesian Center for Volcanology and Geological Hazard Mitigation, CVGHM). PVMBG reported that an explosion at 1152 on 4 October 2018, likely phreatic, generated an ash plume that rose about 250 m above the summit and drifted NW. Eight volcanic earthquakes were recorded about an hour before the event. Based on satellite data and information from PVMBG, the Darwin Volcanic Ash Advisory Centre (VAAC) reported that during 5-6 October ash plumes rose to an altitude of 2.1 km and drifted W and NW. The Alert Level remained at 2 (on a scale of 1-4); visitors and residents were warned not to approach the crater within a 1.5-km radius. On 10 October PVMBG reported only gas emissions (mostly water vapor), and the Aviation Color Code was lowered from Orange to Yellow. 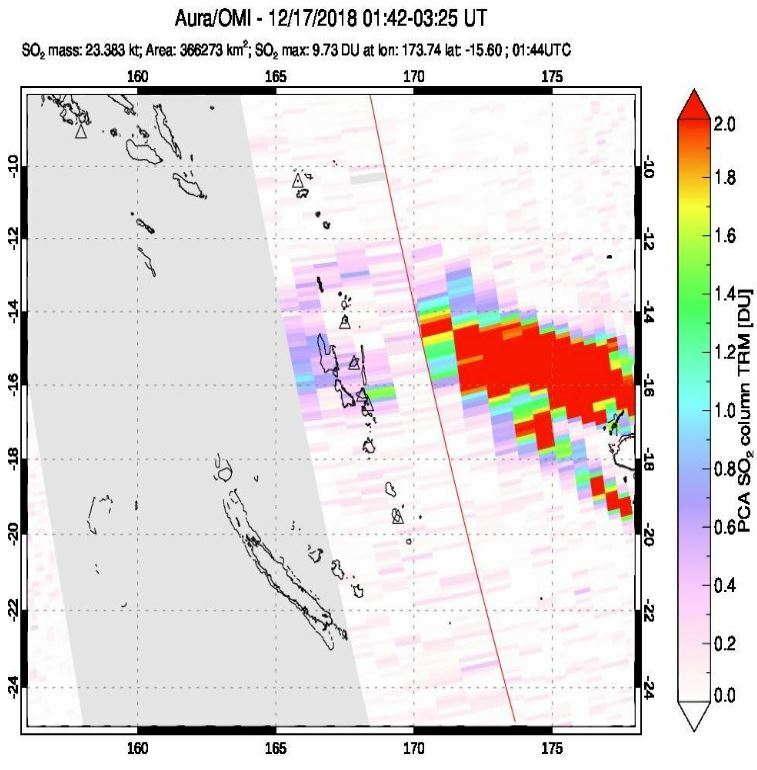 No significant SO2 levels near the volcano were recorded by NASA's satellite-borne ozone instruments (Suomi NPP/OMPS and Aura/OMI) during early October. 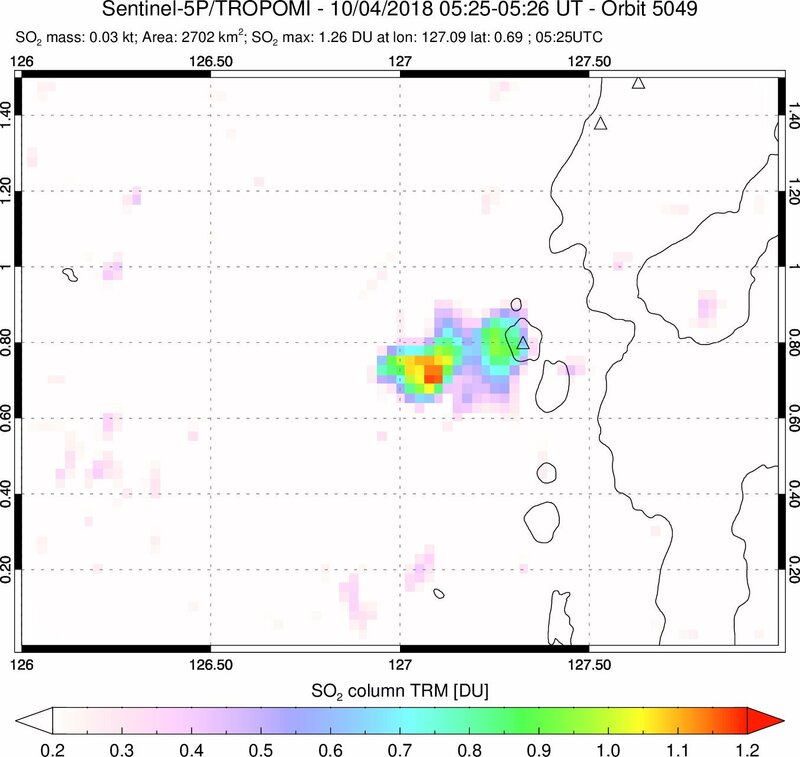 However, Simon Carn reported that the newer TropOMI instrument aboard the Copernicus Sentinel-5P satellite showed significant SO2 levels as high as 12 TRM/DU (levels in middle troposphere layer, as measured in Dobson Units) on 4 October 2018 (figure 7). Figure 7. Weak SO2 emissions from Gamalama on 4 October 2018 were detected by the Sentinel-5P TROPOMI instrument. Courtesy of Simon Carn. Geologic Background. Gamalama is a near-conical stratovolcano that comprises the entire island of Ternate off the western coast of Halmahera, and is one of Indonesia's most active volcanoes. The island was a major regional center in the Portuguese and Dutch spice trade for several centuries, which contributed to the thorough documentation of Gamalama's historical activity. Three cones, progressively younger to the north, form the summit. Several maars and vents define a rift zone, parallel to the Halmahera island arc, that cuts the volcano. Eruptions, recorded frequently since the 16th century, typically originated from the summit craters, although flank eruptions have occurred in 1763, 1770, 1775, and 1962-63. Information Contacts: Pusat Vulkanologi dan Mitigasi Bencana Geologi (PVMBG, also known as Center of Volcanology and Geological Hazard Mitigation (CVGHM), Jalan Diponegoro 5+7, Bandung 40122, Indonesia (URL: http://www.vsi.esdm.go.id/); Darwin Volcanic Ash Advisory Centre (VAAC), Bureau of Meteorology, Northern Territory Regional Office, PO Box 40050, Casuarina, NT 0811, Australia (URL:http://www.bom.gov.au/info/vaac/); Simon Carn, Geological and Mining Engineering and Sciences, Michigan Technological University, 1400 Townsend Drive, Houghton, MI 49931, USA (URL: http://www.volcarno.com/, Twitter: @simoncarn). Select a month and year from the drop-downs and click "Show Issue" to have that issue displayed in this tab. The default month and year is the latest issue available. Ambrym is a shield volcano in the Vanuatu archipelago with a 12-km-wide summit caldera containing the persistently active Benbow and Marum craters. These craters are home to multiple active vents that produce episodic lava lakes, explosions, lava flows, ash, and gas emissions. Occasional fissure eruptions occur outside of these main craters. This report covers July to December 2018 and summarizes reports by the Vanuatu Meteorology and Geohazards Department (VMGD), the Wellington Volcanic Ash Advisory Center (VAAC), and multiple sources of satellite data. As of the beginning of the reporting period, the hazard status at Ambrym had remained at Volcanic Alert Level 2 ("Major unrest") since 7 December 2017. 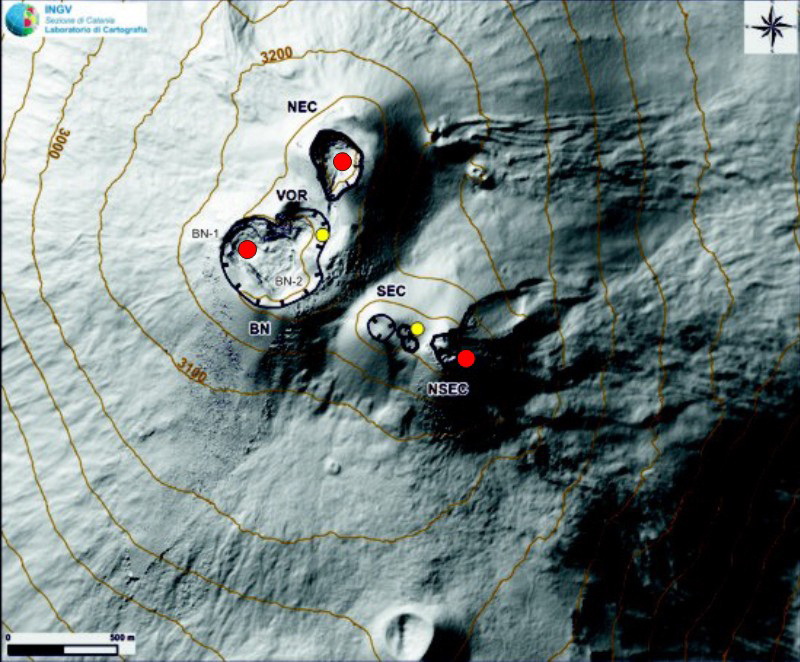 Monthly VMGD activity reports describe the continued activity within the two main craters, consisting of multiple lava lakes, sustained substantial degassing and steam emission, and seismic unrest. Frequent thermal anomalies were detected throughout the reporting period (figure 42). The danger areas were confined to the Permanent Exclusion Zone within a 1 km radius of Benbow crater, and the Permanent Exclusion Zone and Danger Zone A within about a 2.7 km radius of Marum crater (including Maben-Mbwelesu, Niri-Mbwelesu and Mbwelesu, see BGVN 43:07, figure 38). Figure 42. Plot of MODIS thermal infrared data analyzed by MIROVA showing the log radiative power of thermal anomalies at Ambrym for the year ending on 1 February 2019. After the December 2018 eruption no further thermal anomalies were noted for the reporting period. Courtesy of MIROVA. Observations and seismic data analysis by VMGD confirmed the onset of a small-scale intra-caldera fissure eruption at 0600 local time on 15 December. This new fissure produced lava fountains and lava flows with ash and gas plumes (figure 43). 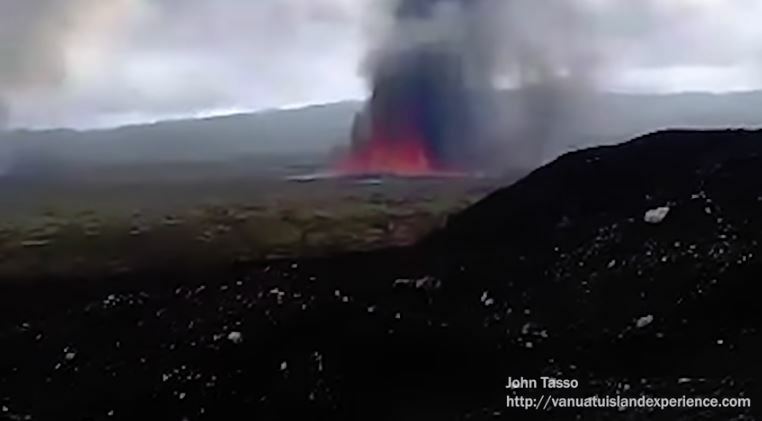 Footage of the eruption by John Tasso shows the fissure eruption to the SE of Marum crater producing lava fountaining. 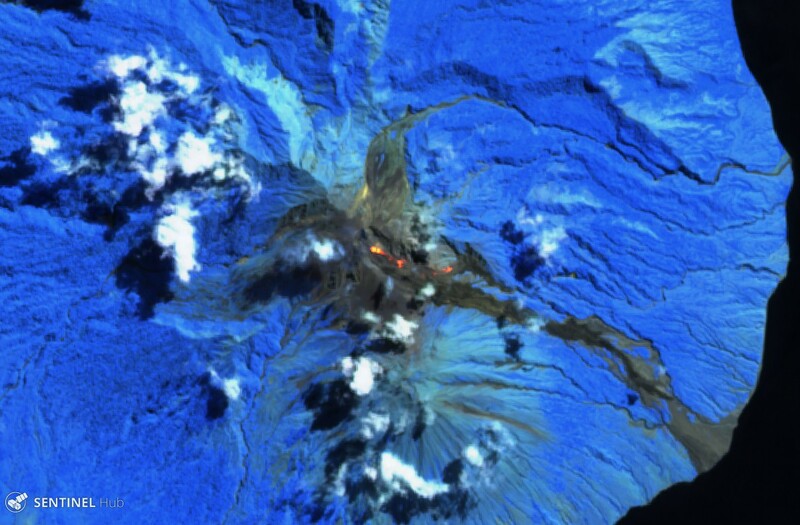 A Sentinel-2 satellite image shows a white eruption plume and two new lava flow lobes (figure 44); the actual fissure vent was hidden by the plume. 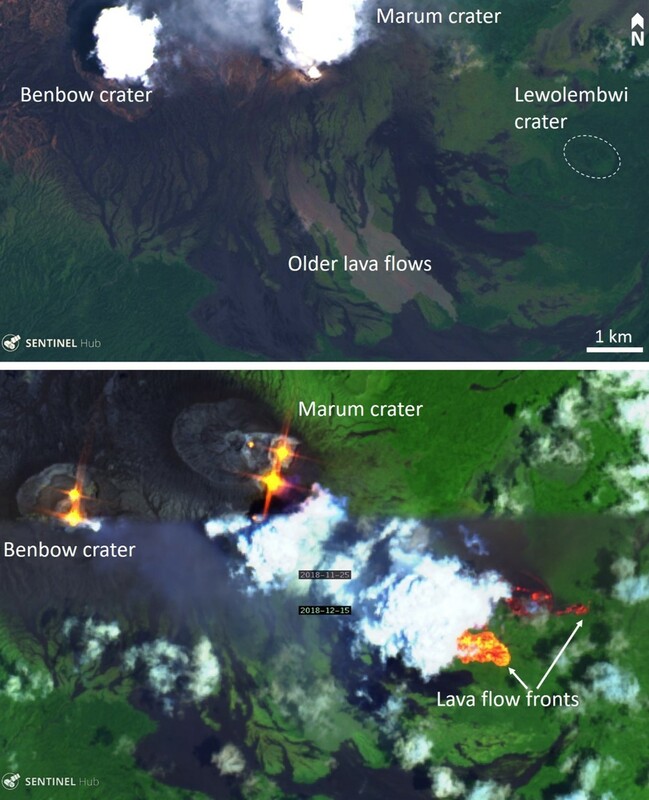 The northernmost lava flow filled in the 500 x 900 m Lewolembwi crater and a smaller lobe continued to flow towards the E (figure 44). Due to this elevated activity, the Volcanic Alert Level was raised to 3 ("Minor eruption"), with the danger zones increased to a 2 km radius around Benbow crater and a 4 km radius around Marum crater. VMGD warned of additional risk within 3 km of eruptive fissures in the SE caldera area. Figure 43. Image of the fissure eruption producing lava fountaining at Ambrym volcano, taken from a video recorded by John Tasso on 16 December 2018. Figure 44. Satellite imagery showing the Ambrym caldera area in November-December 2018. Top: True color Landsat-8 satellite image acquired on 13 December 2018 showing the area prior to the fissure eruption. Bottom: False-color infrared Sentinel-2 composite image (bands 12, 11, and 4) showing the multiple active vents and lava lakes within Marum and Benbow craters (top third of the image, acquired on 25 November 2018), and the eruption plume and the bright orange/red lava flow fronts in the bottom of the image (acquired on 15 December 2018); the fissure is obscured by the plume. Courtesy of Sentinel-Hub Playground. Through 16-17 December, ash and gas emission continued from Benbow and Marum craters (figures 45 and 46), accompanied by ongoing localized seismicity; earthquakes with a magnitude greater than five were felt on neighboring islands. The Wellington VAAC issued ash advisories on 16 and 17 December noting maximum cloud altitudes of approximately 8 km. Figure 45. 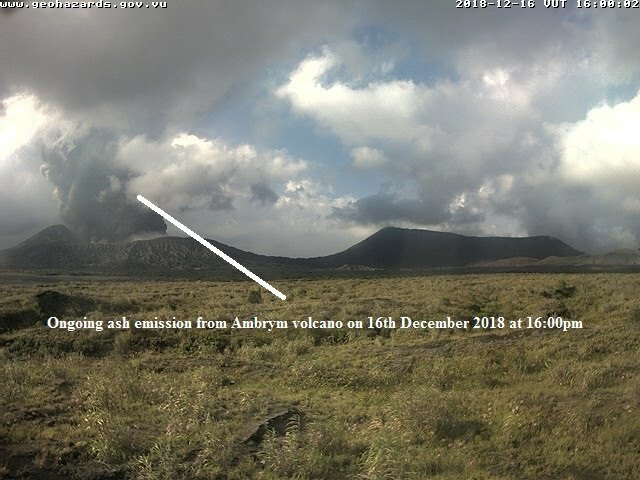 Ash emission from Ambrym volcano at 1600 on 16 December 2018. Webcam image courtesy of, and annotated by, VMGD. Figure 46. Elevated atmospheric SO2 emissions from Ambrym on 17 December 2018 with a total measured mass of 23.383 kt in this scene. The units on the scale bar reflect SO2 in terms of Dobson Units (DU). Courtesy of the NASA Goddard Flight Center Atmospheric Chemistry and Dynamics Laboratory. From 14 to 26 December, the National Volcano Monitoring Network detected over 4,500 earthquakes related to the eruptive activity, but locally felt seismicity decreased. Analysis of satellite imagery confirmed surface deformation associated with the increase in activity. Media reports from Radio New Zealand indicated that seismic activity during December resulted in ground rupture and damage to homes on the island and residents were moved to evacuation centers. During the reporting period, thermal anomalies were frequently detected by the MODIS satellite instruments and subsequently analyzed using the MODVOLC algorithm, reflecting the lava lake activity in Benbow and Marum craters, as well additional thermal anomalies during the December 2018 fissure eruption and subsequent lava flows to the SE of the main crater area (figures 47 and 48). Figure 47. MODVOLC Thermal Alert System from July through December 2018 showing the two active craters of Ambrym, Benbow and Marum, and the December 2018 fissure eruption. Red areas indicate approximate locations of Thermal Anomaly detections along with the number of detections. Courtesy of HIGP - MODVOLC Thermal Alerts System. Figure 48. 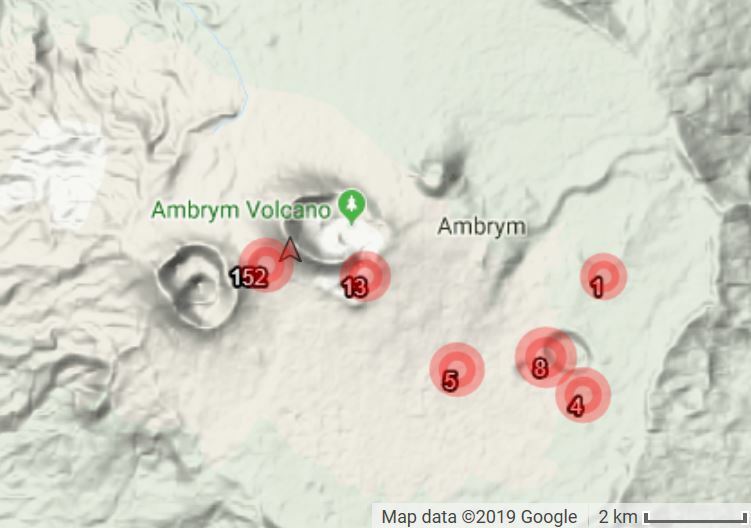 MODVOLC thermal alerts detected over Ambrym volcano during July 2018 through December 2018 showing hot spots located at Benbow and Marum craters and the December 2018 fissure eruption. Courtesy of HIGP - MODVOLC Thermal Alerts System. As of 7 January 2019, Ambrym remains on Alert Level 3 with continued seismic activity. The MIROVA (Middle InfraRed Observation of Volcanic Activity) system has not detected any recent thermal anomalies, indicating the end of the fissure eruption and a reduction in activity at the main craters. Geologic Background. Ambrym, a large basaltic volcano with a 12-km-wide caldera, is one of the most active volcanoes of the New Hebrides arc. A thick, almost exclusively pyroclastic sequence, initially dacitic, then basaltic, overlies lava flows of a pre-caldera shield volcano. The caldera was formed during a major plinian eruption with dacitic pyroclastic flows about 1900 years ago. Post-caldera eruptions, primarily from Marum and Benbow cones, have partially filled the caldera floor and produced lava flows that ponded on the caldera floor or overflowed through gaps in the caldera rim. Post-caldera eruptions have also formed a series of scoria cones and maars along a fissure system oriented ENE-WSW. Eruptions have apparently occurred almost yearly during historical time from cones within the caldera or from flank vents. However, from 1850 to 1950, reporting was mostly limited to extra-caldera eruptions that would have affected local populations. Information Contacts: Geo-Hazards Division, Vanuatu Meteorology and Geo-Hazards Department (VMGD), Ministry of Climate Change Adaptation, Meteorology, Geo-Hazards, Energy, Environment and Disaster Management, Private Mail Bag 9054, Lini Highway, Port Vila, Vanuatu (URL: http://www.vmgd.gov.vu/, https://www.facebook.com/VanuatuGeohazardsObservatory/); Hawai'i Institute of Geophysics and Planetology (HIGP) - MODVOLC Thermal Alerts System, School of Ocean and Earth Science and Technology (SOEST), Univ. of Hawai'i, 2525 Correa Road, Honolulu, HI 96822, USA (URL: http://modis.higp.hawaii.edu/); MIROVA (Middle InfraRed Observation of Volcanic Activity), a collaborative project between the Universities of Turin and Florence (Italy) supported by the Centre for Volcanic Risk of the Italian Civil Protection Department (URL: http://www.mirovaweb.it/); NASA Goddard Space Flight Center (NASA/GSFC), Global Sulfur Dioxide Monitoring Page, Atmospheric Chemistry and Dynamics Laboratory, 8800 Greenbelt Road, Goddard, Maryland, USA (URL: https://so2.gsfc.nasa.gov/); Radio New Zealand, 155 The Terrace, Wellington 6011, New Zealand (URL: https://www.radionz.co.nz/); Sentinel Hub Playground (URL: https://www.sentinel-hub.com/explore/sentinel-playground); John Tasso, Vanuatu Island Experience, Port Vatu, West Ambrym, Vanuatu (URL: http://vanuatuislandexperience.com/). The enormous aerosol cloud from the March-April 1982 eruption of Mexico's El Chichón persisted for years in the stratosphere, and led to the Atmospheric Effects section becoming a regular feature of the Bulletin. Descriptions of the initial dispersal of major eruption clouds remain with the individual eruption reports, but observations of long-term stratospheric aerosol loading will be found in this section. Special announcements of various kinds and obituaries. Reports are sometimes published that are not related to a Holocene volcano. These might include observations of a Pleistocene volcano, earthquake swarms, or floating pumice. Reports are also sometimes published in which the source of the activity is unknown or the report is determined to be false. All of these types of additional reports are listed below by subregion and subject. In discussing the week ending on 12 September, "Earthweek" (Newman, 1997) incorrectly claimed that a volcano named "Mount Pinukis" had erupted. Widely read in the US, the dramatic Earthweek report described terrified farmers and a black mushroom cloud that resembled a nuclear explosion. The mountain's location was given as "200 km E of Zamboanga City," a spot well into the sea. The purported eruption had received mention in a Manila Bulletin newspaper report nine days earlier, on 4 September. Their comparatively understated report said that a local police director had disclosed that residents had seen a dormant volcano showing signs of activity. In response to these news reports Emmanuel Ramos of the Philippine Institute of Volcanology and Seismology (PHIVOLCS) sent a reply on 17 September. PHIVOLCS staff had initially heard that there were some 12 alleged families who fled the mountain and sought shelter in the lowlands. A PHIVOLCS investigation team later found that the reported "families" were actually individuals seeking respite from some politically motivated harassment. The story seems to have stemmed from a local gold rush and an influential politician who wanted to use volcanism as a ploy to exclude residents. PHIVOLCS concluded that no volcanic activity had occurred. They also added that this finding disappointed local politicians but was much welcomed by the residents. PHIVOLCS spelled the mountain's name as "Pinokis" and from their report it seems that it might be an inactive volcano. There is no known Holocene volcano with a similar name (Simkin and Siebert, 1994). No similar names (Pinokis, Pinukis, Pinakis, etc.) were found listed in the National Imagery and Mapping Agency GEOnet Names Server (http://geonames.nga.mil/gns/html/index.html), a searchable database of 3.3 million non-US geographic-feature names. The Manila Bulletin report suggested that Pinokis resides on the Zamboanga Peninsula. The Peninsula lies on Mindanao Island's extreme W side where it bounds the Moro Gulf, an arm of the Celebes Sea. The mountainous Peninsula trends NNE-SSW and contains peaks with summit elevations near 1,300 m. Zamboanga City sits at the extreme end of the Peninsula and operates both a major seaport and an international airport. References. Newman, S., 1997, Earthweek, a diary of the planet (week ending 12 September): syndicated newspaper column (URL: http://www.earthweek.com/). Manila Bulletin, 4 Sept. 1997, Dante's Peak (URL: http://www.mb.com.ph/). Simkin, T., and Siebert, L., 1994, Volcanoes of the world, 2nd edition: Geoscience Press in association with the Smithsonian Institution Global Volcanism Program, Tucson AZ, 368 p.
Information Contacts: Emmanuel G. Ramos, Deputy Director, Philippine Institute of Volcanology and Seismology, Department of Science and Technology, PHIVOLCS Building, C. P. Garcia Ave., University of the Philippines, Diliman campus, Quezon City, Philippines. Xinhua News Agency filed a news report on 27 February under the headline "Volcano erupts in Somalia" but the veracity of the story now appears doubtful. The report disclosed the volcano's location as on the W side of the Gedo region, an area along the Ethiopian border just NE of Kenya. The report had relied on the commissioner of the town of Bohol Garas (a settlement described as 40 km NE of the main Al-Itihad headquarters of Luq town) and some or all of the information was relayed by journalists through VHF radio. The report claimed the disaster "wounded six herdsmen" and "claimed the lives of 290 goats grazing near the mountain when the incident took place." Further descriptions included such statements as "the volcano which erupted two days ago [25 February] has melted down the rocks and sand and spread . . . ."
Giday WoldeGabriel returned from three weeks of geological fieldwork in SW Ethiopia, near the Kenyan border, on 25 August. During his time there he inquired of many people, including geologists, if they had heard of a Somalian eruption in the Gedo area; no one had heard of the event. WoldeGabriel stated that he felt the news report could have described an old mine or bomb exploding. Heavy fighting took place in the Gedo region during the Ethio-Somalian war of 1977. Somalia lacks an embassy in Washington DC; when asked during late August, Ayalaw Yiman, an Ethiopian embassy staff member in Washington DC also lacked any knowledge of a Somalian eruption. A Somalian eruption would be significant since the closest known Holocene volcanoes occur in the central Ethiopian segment of the East African rift system S of Addis Ababa, ~500 km NW of the Gedo area. These Ethiopian rift volcanoes include volcanic fields, shield volcanoes, cinder cones, and stratovolcanoes. Information Contacts: Xinhua News Agency, 5 Sharp Street West, Wanchai, Hong Kong; Giday WoldeGabriel, EES-1/MS D462, Geology-Geochemistry Group, Los Alamos National Laboratory, Los Alamos, NM 87545; Ayalaw Yiman, Ethiopian Embassy, 2134 Kalorama Rd. NW, Washington DC 20008. Following the Ms 7.8 earthquake in Turkey on 17 August (BGVN 24:08) an Email message originating in Turkey was circulated, claiming that volcanic activity was observed coincident with the earthquake and suggesting a new (magmatic) volcano in the Sea of Marmara. For reasons outlined below, and in the absence of further evidence, editors of the Bulletin consider this a false report. The report stated that fishermen near the village of Cinarcik, at the E end of the Sea of Marmara "saw the sea turned red with fireballs" shortly after the onset of the earthquake. They later found dead fish that appeared "fried." Their nets were "burned" while under water and contained samples of rocks alleged to look "magmatic." No samples of the fish were preserved. A tectonic scientist in Istanbul speculated that hot water released by the earthquake from the many hot springs along the coast in that area may have killed some fish (although they would be boiled rather than fried). The phenomenon called earthquake lights could explain the "fireballs" reportedly seen by the fishermen. Such effects have been reasonably established associated with large earthquakes, although their origin remains poorly understood. In addition to deformation-triggered piezoelectric effects, earthquake lights have sometimes been explained as due to the release of methane gas in areas of mass wasting (even under water). Omlin and others (1999), for example, found gas hydrate and methane releases associated with mud volcanoes in coastal submarine environments. (B) Romania, 10 November 1940. ". . . a thick layer like a translucid gas above the surface of the soil . . . irregular gas fires . . . flames in rhythm with the movements of the soil . . . flashes like lightning from the floor to the summit of Mt Tampa . . . flames issuing from rocks, which crumbled, with flashes also issuing from non-wooded mountainsides." (Phrases used in eyewitness accounts collected by Demetrescu and Petrescu, 1941). (C) Sungpan-Pingwu (China), 16, 22, and 23 August 1976. "From March of 1976, various large anomalies were observed over a broad region. . . . At the Wanchia commune of Chungching County, outbursts of natural gas from rock fissures ignited and were difficult to extinguish even by dumping dirt over the fissures. . . . Chu Chieh Cho, of the Provincial Seismological Bureau, related personally seeing a fireball 75 km from the epicenter on the night of 21 July while in the company of three professional seismologists." Yalciner and others (1999) made a study of coastal areas along the Sea of Marmara after the Izmet earthquake. They found evidence for one or more tsunamis with maximum runups of 2.0-2.5 m. Preliminary modeling of the earthquake's response failed to reproduce the observed runups; the areas of maximum runup instead appeared to correspond most closely with several local mass-failure events. This observation together with the magnitude of the earthquake, and bottom soundings from marine geophysical teams, suggested mass wasting may have been fairly common on the floor of the Sea of Marmara. Despite a wide range of poorly understood, dramatic processes associated with earthquakes (Izmet 1999 apparently included), there remains little evidence for volcanism around the time of the earthquake. The nearest Holocene volcano lies ~200 km SW of the report location. Neither Turkish geologists nor scientists from other countries in Turkey to study the 17 August earthquake reported any volcanism. The report said the fisherman found "magmatic" rocks; it is unlikely they would be familiar with this term. The motivation and credibility of the report's originator, Erol Erkmen, are unknown. Certainly, the difficulty in translating from Turkish to English may have caused some problems in understanding. Erkmen is associated with a website devoted to reporting UFO activity in Turkey. Photographs of a "magmatic rock" sample were sent to the Bulletin, but they only showed dark rocks photographed devoid of a scale on a featureless background. The rocks shown did not appear to be vesicular or glassy. What was most significant to Bulletin editors was the report author's progressive reluctance to provide samples or encourage follow-up investigation with local scientists. Without the collaboration of trained scientists on the scene this report cannot be validated. References. Omlin, A, Damm, E., Mienert, J., and Lukas, D., 1999, In-situ detection of methane releases adjacent to gas hydrate fields on the Norwegian margin: (Abstract) Fall AGU meeting 1999, Eos, American Geophysical Union. Yalciner, A.C., Borrero, J., Kukano, U., Watts, P., Synolakis, C. E., and Imamura, F., 1999, Field survey of 1999 Izmit tsunami and modeling effort of new tsunami generation mechanism: (Abstract) Fall AGU meeting 1999, Eos, American Geophysical Union. Gold, T., 1998, The deep hot biosphere: Springer Verlag, 256 p., ISBN: 0387985468. Gold, T., 2000, Eye-witness accounts of several major earthquakes (URL: http://www.people.cornell.edu/ pages/tg21/eyewit.html). Information Contacts: Erol Erkmen, Tuvpo Project Alp. In December 2002 information appeared in Mongolian and Russian newspapers and on national TV that a volcano in Central Mongolia, the Har-Togoo volcano, was producing white vapors and constant acoustic noise. Because of the potential hazard posed to two nearby settlements, mainly with regard to potential blocking of rivers, the Director of the Research Center of Astronomy and Geophysics of the Mongolian Academy of Sciences, Dr. Bekhtur, organized a scientific expedition to the volcano on 19-20 March 2003. The scientific team also included M. Ulziibat, seismologist from the same Research Center, M. Ganzorig, the Director of the Institute of Informatics, and A. Ivanov from the Institute of the Earth's Crust, Siberian Branch of the Russian Academy of Sciences. Geological setting. The Miocene Har-Togoo shield volcano is situated on top of a vast volcanic plateau (figure 1). The 5,000-year-old Khorog (Horog) cone in the Taryatu-Chulutu volcanic field is located 135 km SW and the Quaternary Urun-Dush cone in the Khanuy Gol (Hanuy Gol) volcanic field is 95 km ENE. Pliocene and Quaternary volcanic rocks are also abundant in the vicinity of the Holocene volcanoes (Devyatkin and Smelov, 1979; Logatchev and others, 1982). Analysis of seismic activity recorded by a network of seismic stations across Mongolia shows that earthquakes of magnitude 2-3.5 are scattered around the Har-Togoo volcano at a distance of 10-15 km. Figure 1. Photograph of the Har-Togoo volcano viewed from west, March 2003. Courtesy of Alexei Ivanov. Observations during March 2003. The name of the volcano in the Mongolian language means "black-pot" and through questioning of the local inhabitants, it was learned that there is a local myth that a dragon lived in the volcano. The local inhabitants also mentioned that marmots, previously abundant in the area, began to migrate westwards five years ago; they are now practically absent from the area. Acoustic noise and venting of colorless warm gas from a small hole near the summit were noticed in October 2002 by local residents. In December 2002, while snow lay on the ground, the hole was clearly visible to local visitors, and a second hole could be seen a few meters away; it is unclear whether or not white vapors were noticed on this occasion. During the inspection in March 2003 a third hole was seen. The second hole is located within a 3 x 3 m outcrop of cinder and pumice (figure 2) whereas the first and the third holes are located within massive basalts. When close to the holes, constant noise resembled a rapid river heard from afar. The second hole was covered with plastic sheeting fixed at the margins, but the plastic was blown off within 2-3 seconds. Gas from the second hole was sampled in a mechanically pumped glass sampler. Analysis by gas chromatography, performed a week later at the Institute of the Earth's Crust, showed that nitrogen and atmospheric air were the major constituents. Figure 2. Photograph of the second hole sampled at Har-Togoo, with hammer for scale, March 2003. Courtesy of Alexei Ivanov. The temperature of the gas at the first, second, and third holes was +1.1, +1.4, and +2.7°C, respectively, while air temperature was -4.6 to -4.7°C (measured on 19 March 2003). Repeated measurements of the temperatures on the next day gave values of +1.1, +0.8, and -6.0°C at the first, second, and third holes, respectively. Air temperature was -9.4°C. To avoid bias due to direct heating from sunlight the measurements were performed under shadow. All measurements were done with Chechtemp2 digital thermometer with precision of ± 0.1°C and accuracy ± 0.3°C. Inside the mouth of the first hole was 4-10-cm-thick ice with suspended gas bubbles (figure 5). The ice and snow were sampled in plastic bottles, melted, and tested for pH and Eh with digital meters. The pH-meter was calibrated by Horiba Ltd (Kyoto, Japan) standard solutions 4 and 7. Water from melted ice appeared to be slightly acidic (pH 6.52) in comparison to water of melted snow (pH 7.04). Both pH values were within neutral solution values. No prominent difference in Eh (108 and 117 for ice and snow, respectively) was revealed. Two digital short-period three-component stations were installed on top of Har-Togoo, one 50 m from the degassing holes and one in a remote area on basement rocks, for monitoring during 19-20 March 2003. Every hour 1-3 microseismic events with magnitude <2 were recorded. All seismic events were virtually identical and resembled A-type volcano-tectonic earthquakes (figure 6). Arrival difference between S and P waves were around 0.06-0.3 seconds for the Har-Togoo station and 0.1-1.5 seconds for the remote station. Assuming that the Har-Togoo station was located in the epicentral zone, the events were located at ~1-3 km depth. Seismic episodes similar to volcanic tremors were also recorded (figure 3). Figure 3. Examples of an A-type volcano-tectonic earthquake and volcanic tremor episodes recorded at the Har-Togoo station on 19 March 2003. Courtesy of Alexei Ivanov. Conclusions. The abnormal thermal and seismic activities could be the result of either hydrothermal or volcanic processes. This activity could have started in the fall of 2002 when they were directly observed for the first time, or possibly up to five years earlier when marmots started migrating from the area. Further studies are planned to investigate the cause of the fumarolic and seismic activities. At the end of a second visit in early July, gas venting had stopped, but seismicity was continuing. In August there will be a workshop on Russian-Mongolian cooperation between Institutions of the Russian and Mongolian Academies of Sciences (held in Ulan-Bator, Mongolia), where the work being done on this volcano will be presented. References. Devyatkin, E.V. and Smelov, S.B., 1979, Position of basalts in sequence of Cenozoic sediments of Mongolia: Izvestiya USSR Academy of Sciences, geological series, no. 1, p. 16-29. (In Russian). Logatchev, N.A., Devyatkin, E.V., Malaeva, E.M., and others, 1982, Cenozoic deposits of Taryat basin and Chulutu river valley (Central Hangai): Izvestiya USSR Academy of Sciences, geological series, no. 8, p. 76-86. (In Russian). Geologic Background. The Miocene Har-Togoo shield volcano, also known as Togoo Tologoy, is situated on top of a vast volcanic plateau. The 5,000-year-old Khorog (Horog) cone in the Taryatu-Chulutu volcanic field is located 135 km SW and the Quaternary Urun-Dush cone in the Khanuy Gol (Hanuy Gol) volcanic field is 95 km ENE. Analysis of seismic activity recorded by a network of seismic stations across Mongolia shows that earthquakes of magnitude 2-3.5 are scattered around the Har-Togoo volcano at a distance of 10-15 km. Information Contacts: Alexei V. Ivanov, Institute of the Earth Crust SB, Russian Academy of Sciences, Irkutsk, Russia; Bekhtur andM. Ulziibat, Research Center of Astronomy and Geophysics, Mongolian Academy of Sciences, Ulan-Bator, Mongolia; M. Ganzorig, Institute of Informatics MAS, Ulan-Bator, Mongolia. An eruption at Mount Elgon was mistakenly inferred when fumes escaped from this otherwise quiet volcano. The fumes were eventually traced to dung burning in a lava-tube cave. The cave is home to, or visited by, wildlife ranging from bats to elephants. Mt. Elgon (Ol Doinyo Ilgoon) is a stratovolcano on the SW margin of a 13 x 16 km caldera that straddles the Uganda-Kenya border 140 km NE of the N shore of Lake Victoria. No eruptions are known in the historical record or in the Holocene. On 7 September 2004 the web site of the Kenyan newspaper The Daily Nation reported that villagers sighted and smelled noxious fumes from a cave on the flank of Mt. Elgon during August 2005. The villagers' concerns were taken quite seriously by both nations, to the extent that evacuation of nearby villages was considered. The Daily Nation article added that shortly after the villagers' reports, Moses Masibo, Kenya's Western Province geology officer visited the cave, confirmed the villagers observations, and added that the temperature in the cave was 170°C. He recommended that nearby villagers move to safer locations. Masibo and Silas Simiyu of KenGens geothermal department collected ashes from the cave for testing. Gerald Ernst reported on 19 September 2004 that he spoke with two local geologists involved with the Elgon crisis from the Geology Department of the University of Nairobi (Jiromo campus): Professor Nyambok and Zacharia Kuria (the former is a senior scientist who was unable to go in the field; the latter is a junior scientist who visited the site). According to Ernst their interpretation is that somebody set fire to bat guano in one of the caves. The fire was intense and probably explains the vigorous fuming, high temperatures, and suffocated animals. The event was also accompanied by emissions of gases with an ammonia odor. Ernst noted that this was not surprising considering the high nitrogen content of guano—ammonia is highly toxic and can also explain the animal deaths. The intense fumes initially caused substantial panic in the area. It was Ernst's understanding that the authorities ordered evacuations while awaiting a report from local scientists, but that people returned before the report reached the authorities. The fire presumably prompted the response of local authorities who then urged the University geologists to analyze the situation. By the time geologists arrived, the fuming had ceased, or nearly so. The residue left by the fire and other observations led them to conclude that nothing remotely related to a volcanic eruption had occurred. However, the incident emphasized the problem due to lack of a seismic station to monitor tectonic activity related to a local triple junction associated with the rift valley or volcanic seismicity. In response, one seismic station was moved from S Kenya to the area of Mt. Elgon so that local seismicity can be monitored in the future. Information Contacts: Gerald Ernst, Univ. of Ghent, Krijgslaan 281/S8, B-9000, Belgium; Chris Newhall, USGS, Univ. of Washington, Dept. of Earth & Space Sciences, Box 351310, Seattle, WA 98195-1310, USA; The Daily Nation (URL: http://www.nationmedia.com/dailynation/); Uganda Tourist Board (URL: http://www.visituganda.com/).